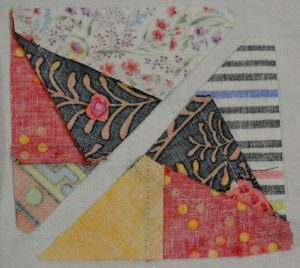 This month’s block is another applique block and we are only making one. 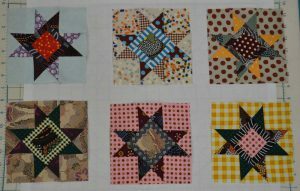 You are receiving one yard of fabric per month, which is obviously too much for just one block, but remember there are lots of blocks to come along with filler blocks at the end. 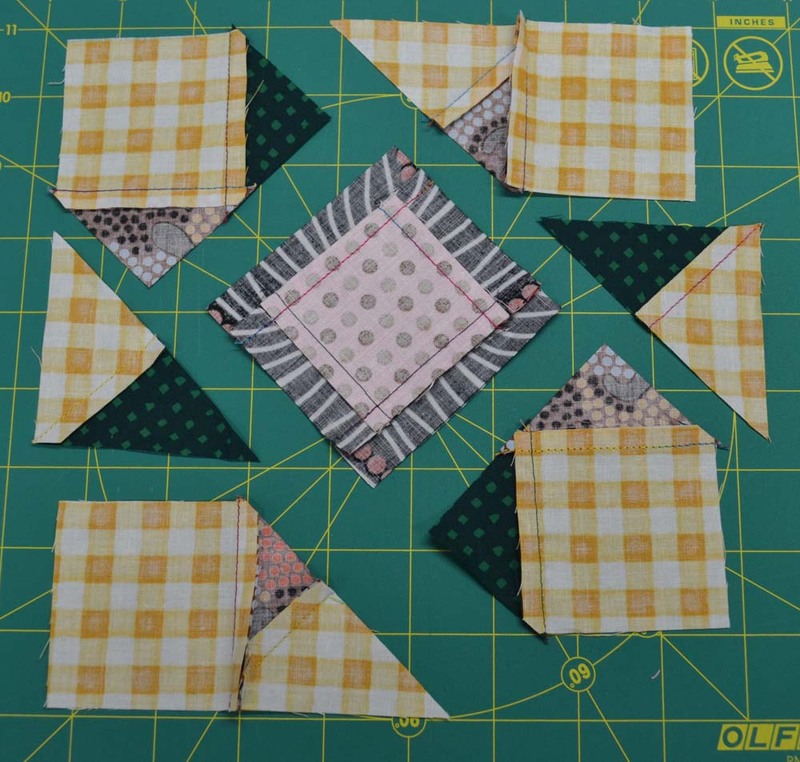 The instructions are great, but experiment with the outer T6 piecing. 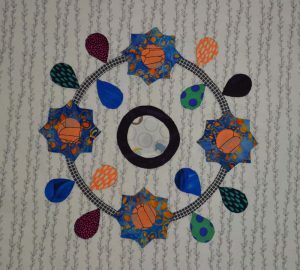 I made the first one by stitching the 4 units together, then adding the center circle. 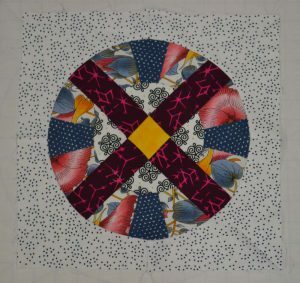 I found this difficult because the diameter of the center pieced circle was not exactly the same size as the diameter of the circle I was adding it to. 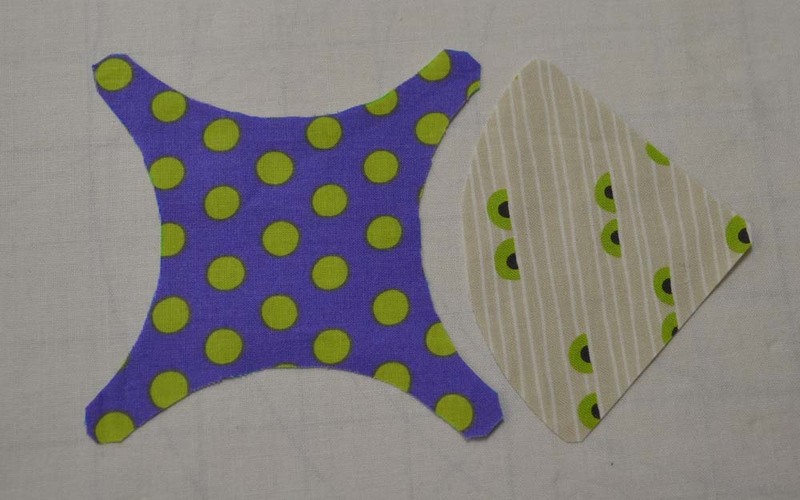 I found it easier to leave a seam allowance on each ‘end’ of the T6 template and sew them one at a time, then joining the pieces as you would a set-in seam. I LOVE the look of this block, but I sure wouldn’t want to make a King size quilt with it! 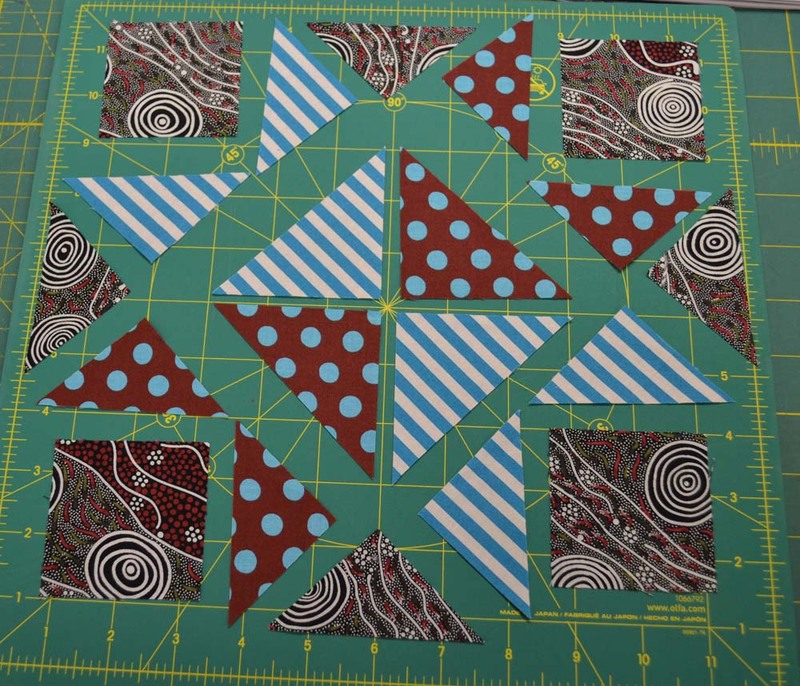 16 small curved pieces per block, plus lots of small triangles to complete it. Just a few notes to begin, T11 is not a 60 degree triangle although it looks close. In cutting the T7 and T8 pieces, take the time to cut the ‘dog ears’. 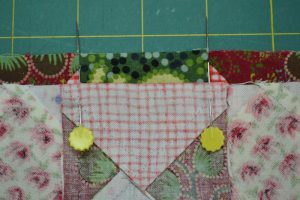 It will make piecing so much easier! Press T7 outward toward T8. Good Luck everyone! See you next time. This is our last month together working on Bakers Dozen. I have really enjoyed the journey, and I loved working with all of you. 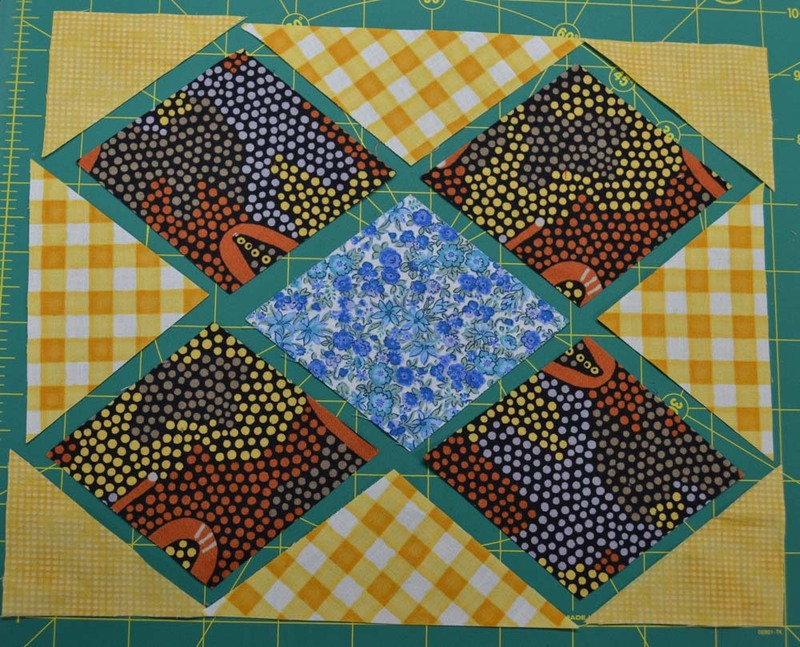 If you are interested, we are offering Jen’s latest Template of the Month, Golden Days. 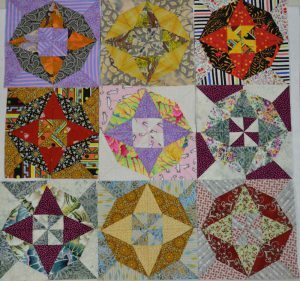 We still have openings in our May group, so I hope you decide to join us. Click here to sign up. 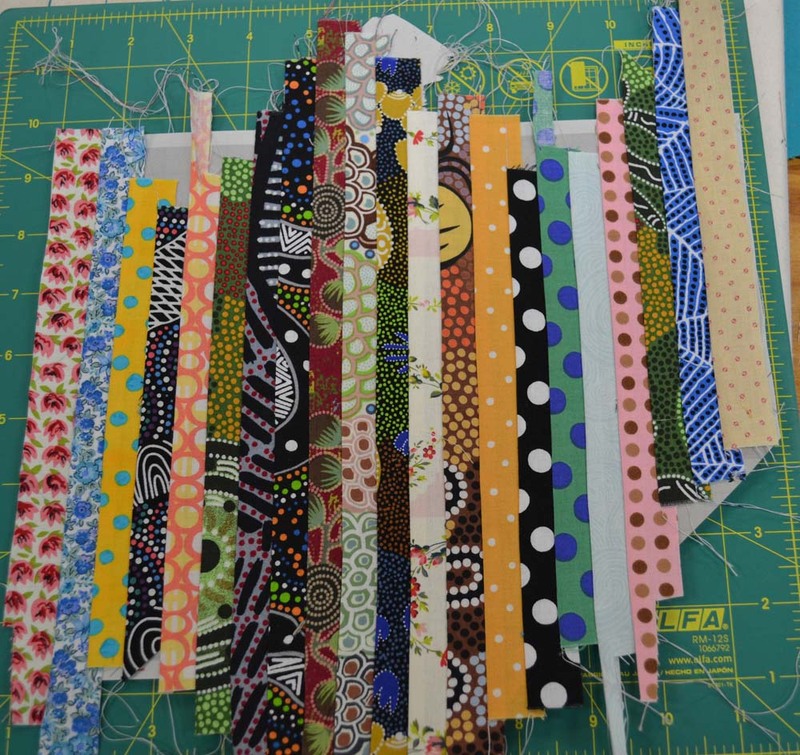 By this time, you are getting down to the bare bones of your fabric for this project. 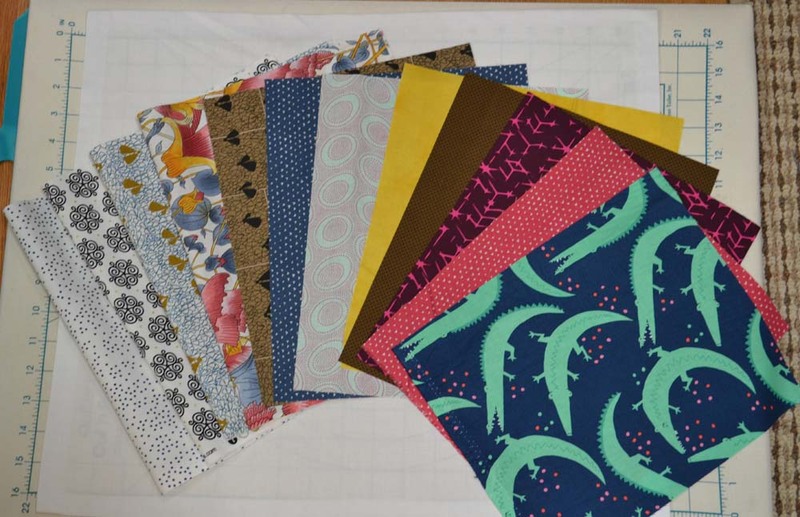 The pattern called for 8 yards of a variety of fabrics, and 7/8 yd for the inner border and binding. If you have run out of fabric, please let me know. You can always add some of your own stash for the Corner Block Strips. 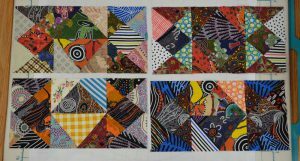 Each block has (2) T13 and (2) T13 rev. 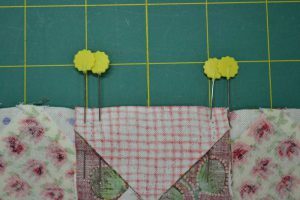 Make sure you have these in the right place before you sew, or your block will not fit. 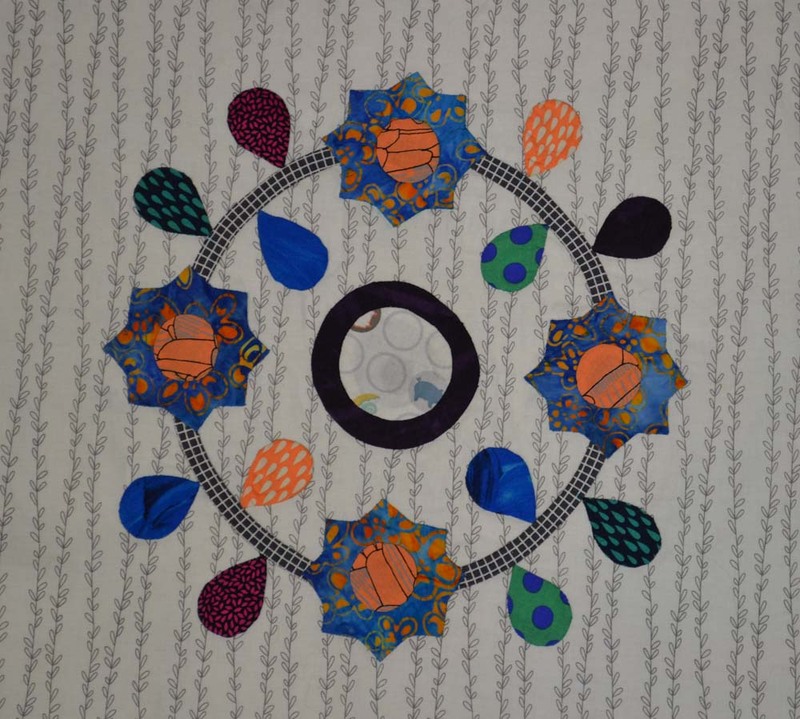 The drawing in the pattern make T16 and T17 look identical – They are not! 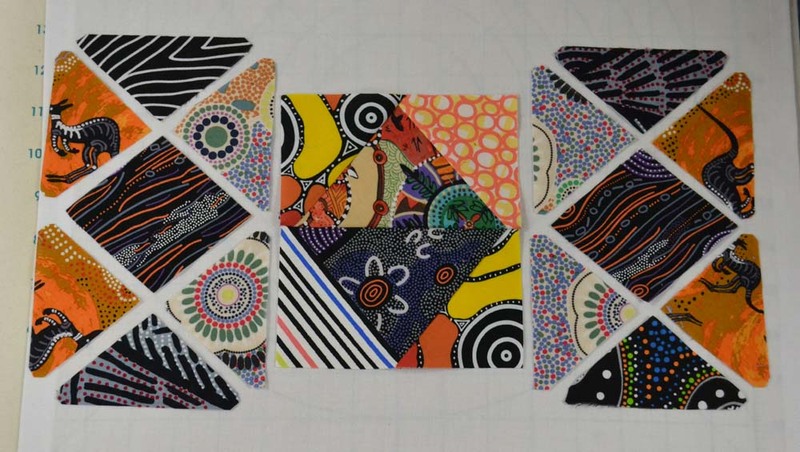 Once again, I suggest you cut all your pieces out and place them on your work table. Sew section by section to avoid confusion. I don’t have much insight on this block as it is pretty straight-forward. 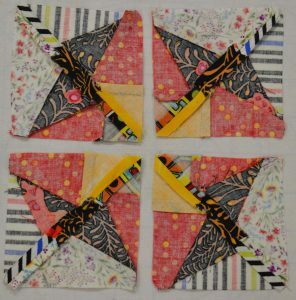 The photo in the pattern shows each corner block with the same strips in the same order. I did not have enough fabric to accomplish this. I used what I had left, and I’m very happy with the result. 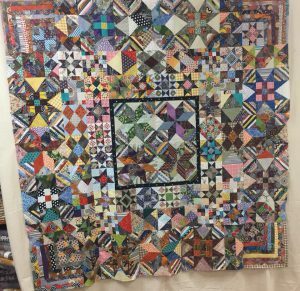 This quilt is at its essence a center medallion with pieced borders. 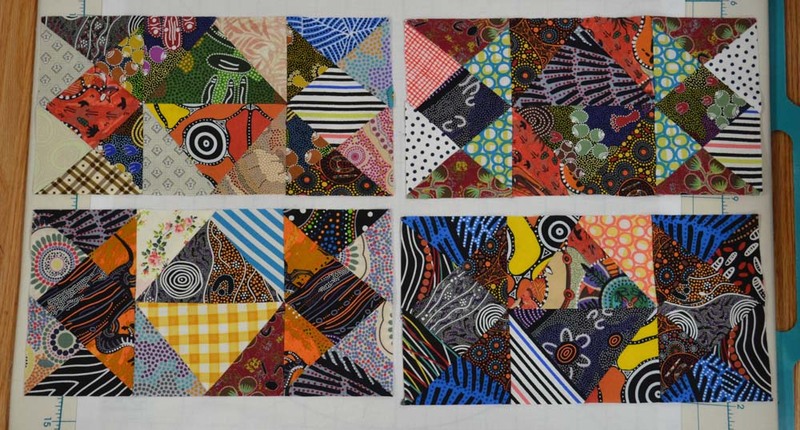 The biggest problem with assembling this type of quilt is that each border has to fit exactly. You may have to ease (sometimes quite a bit) in order to make this happen. 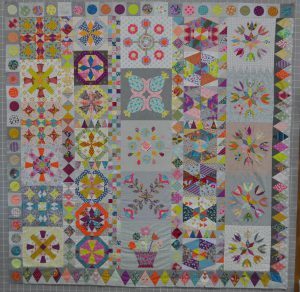 When I started to add the 2nd pieced border (the one with the Checkerboard Blocks) I actually ended up removing a row from two of my Checkerboard blocks to make this row fit. 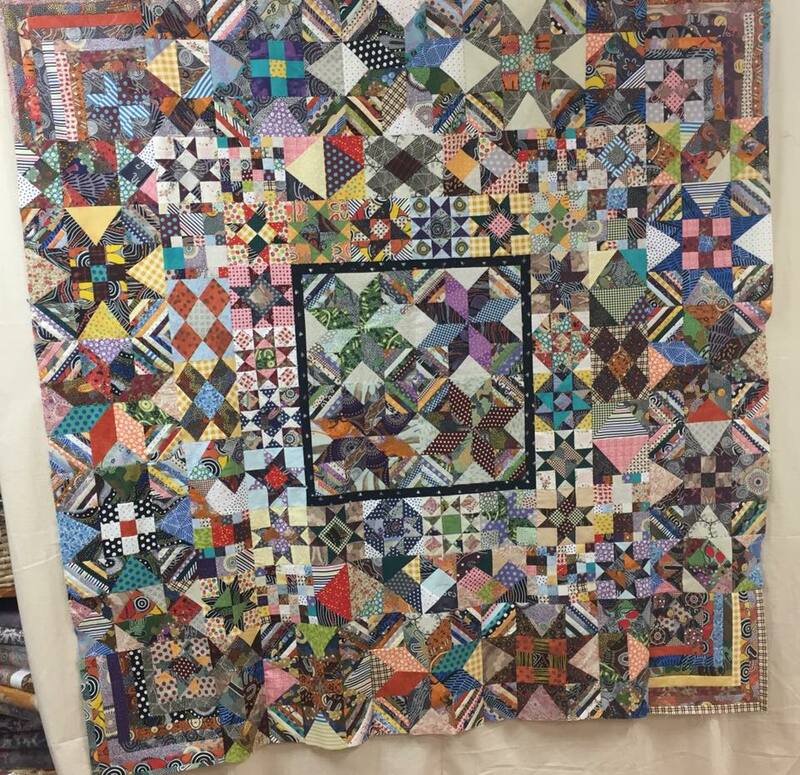 I would challenge anyone to look at my finished quilt and see that I did that. Once again, thanks again for making Bakers Dozen with me! Hello Everyone and welcome to Jen Kingwell’s latest Template of the Month! 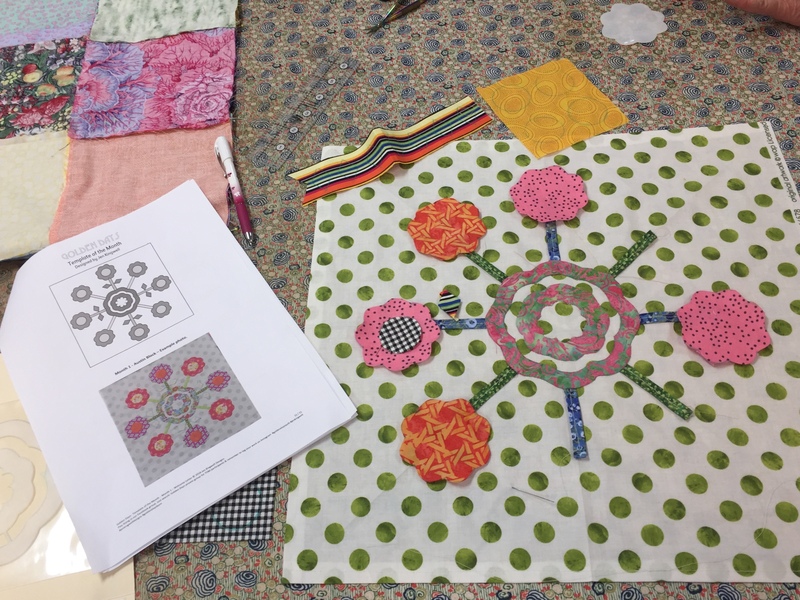 Thank you for joining me on this wonderful adventure to play with fabrics and colors. 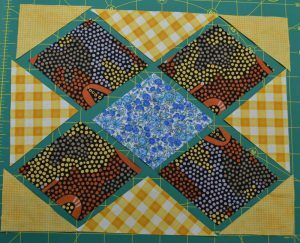 As always, there are a few challenges for us, but she promises it is a bit simpler than previous quilts. Thank you for that, Jen! 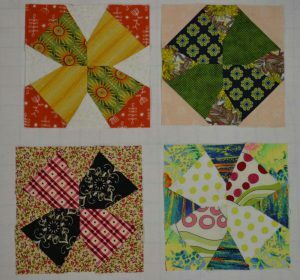 There are several applique blocks along with pieced blocks (I have not received the entire pattern so I can’t give you specifics on the blocks). You will receive 12 yards of fabric over 12 months, but no duplicates. 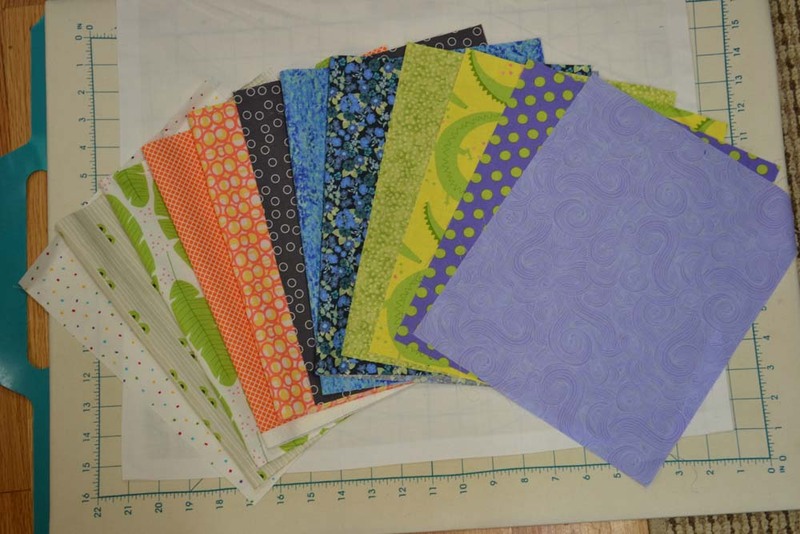 Hang on to each month’s fabrics so you have a generous supply with which to work. Please join HeartSong’s private Golden Days Facebook group which you can find by clicking here. 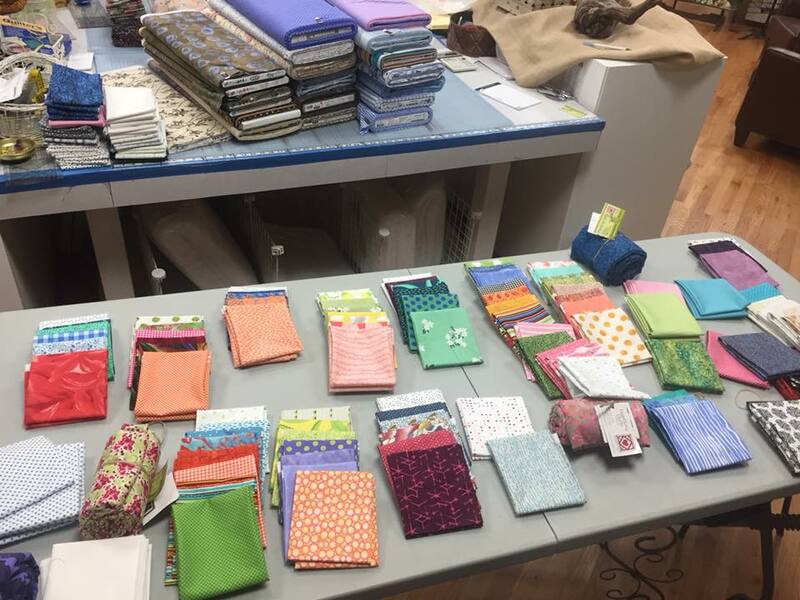 Jen Kingwell also is setting up a Golden Days Facebook group. Search Golden Days – Private Group for TOM Participants. 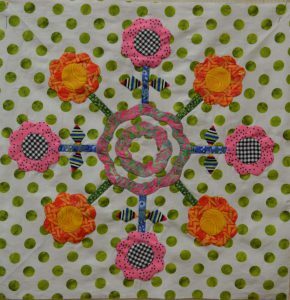 Both Facebook groups open you up to wonderful groups of people who are working together on this quilt from all over the world. 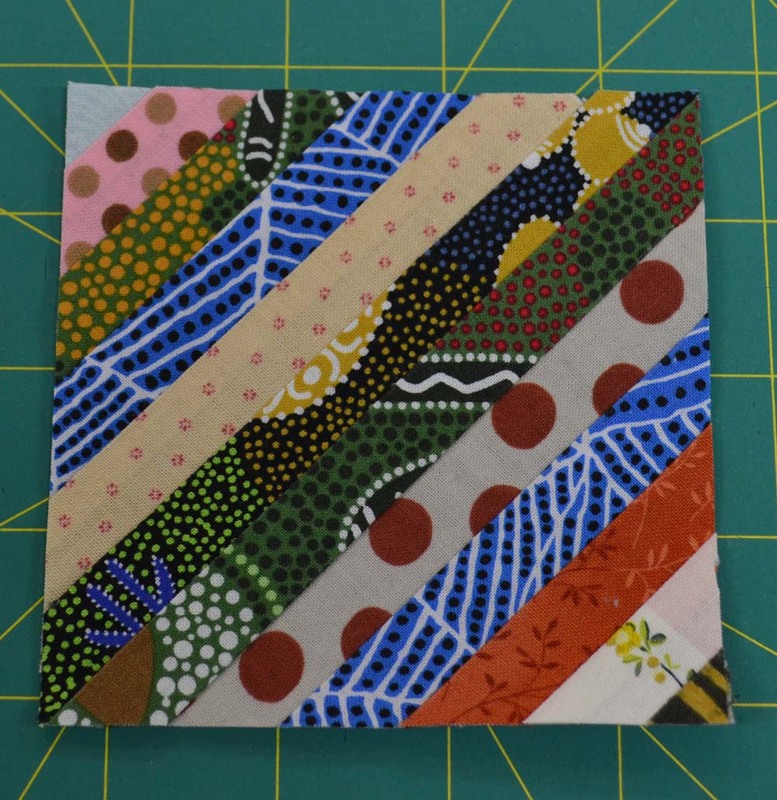 Confession time…my challenge for myself is to learn how to do needle turn applique if it kills me! 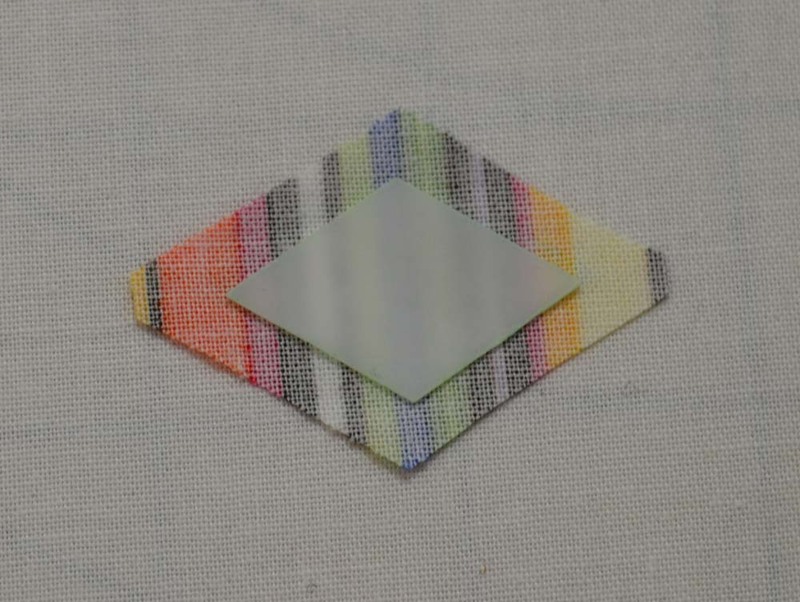 This will be my first attempt (so don’t look too closely at my stitches). 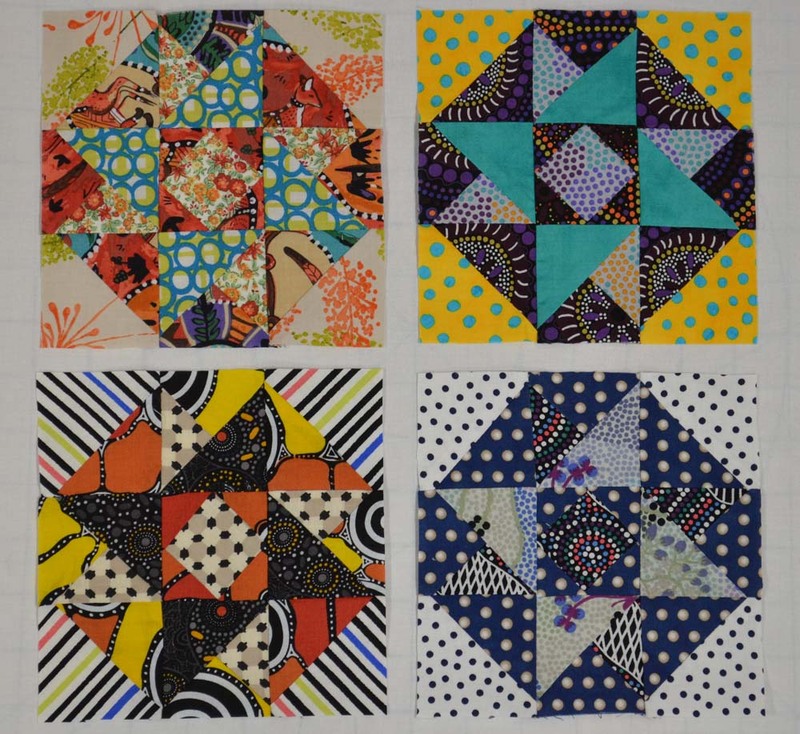 I will be posting a video on the HeartSong Quilts Facebook page with some basic information and a couple of things that I found to be handy. Click here for HeartSong’s Facebook page. 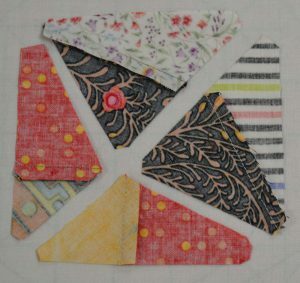 The mylar templates in this months kit are really nice as they are heat resistant. 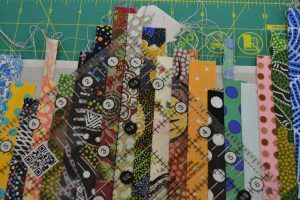 After cutting around your traced template with a 3/8” seam allowance, you can press the seams over the template if you want to get a head start of the needle turning business. 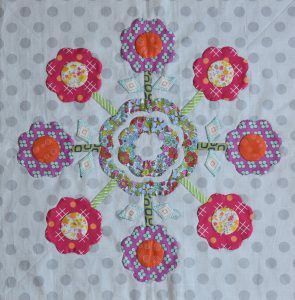 I decided to put my circles on my flowers before I stitched them to the background fabric. I found it a little easier to manipulate the smaller piece. 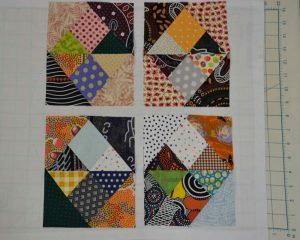 Here is my completed Austin Block. This was a lot of fun! Until next time, happy stitching! We’re getting ready to kick off the Golden Days Template of the Month program. We just received the pattern and templates for the first month, so Ann is busy making it (and having fun while doing so, I might add). 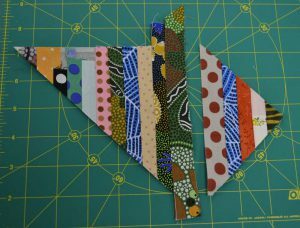 Here’s a photo of Ann’s work thus far. 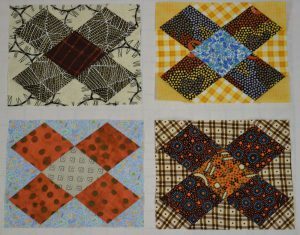 Even though we don’t have the entire quilt pattern, Ann has been auditioning fabrics based upon what we know about the quilt. 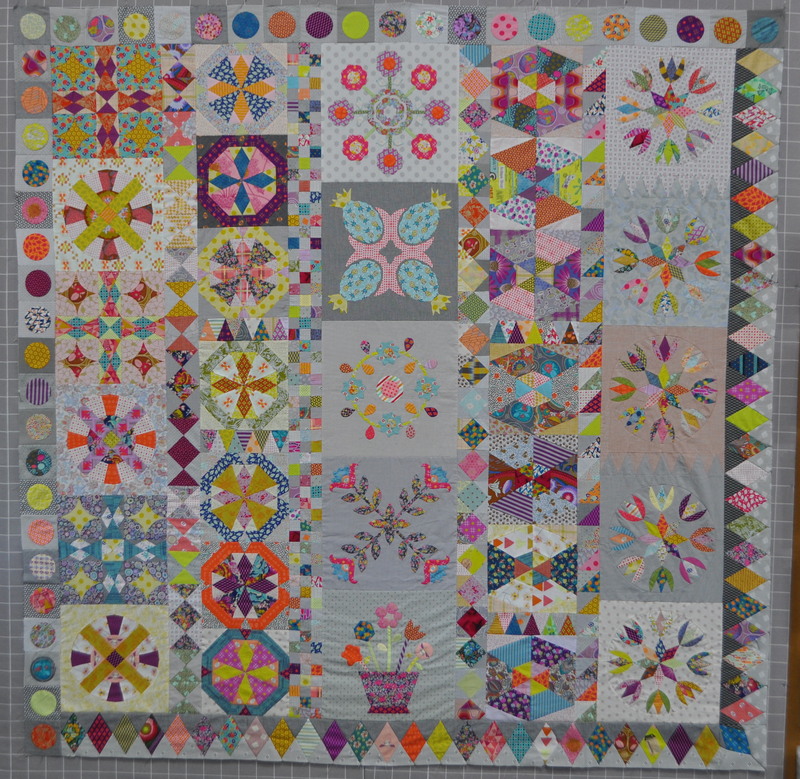 Here’s a photo of the entire quilt made by Jen Kingwell, as well as a photo of the block for Month 1. 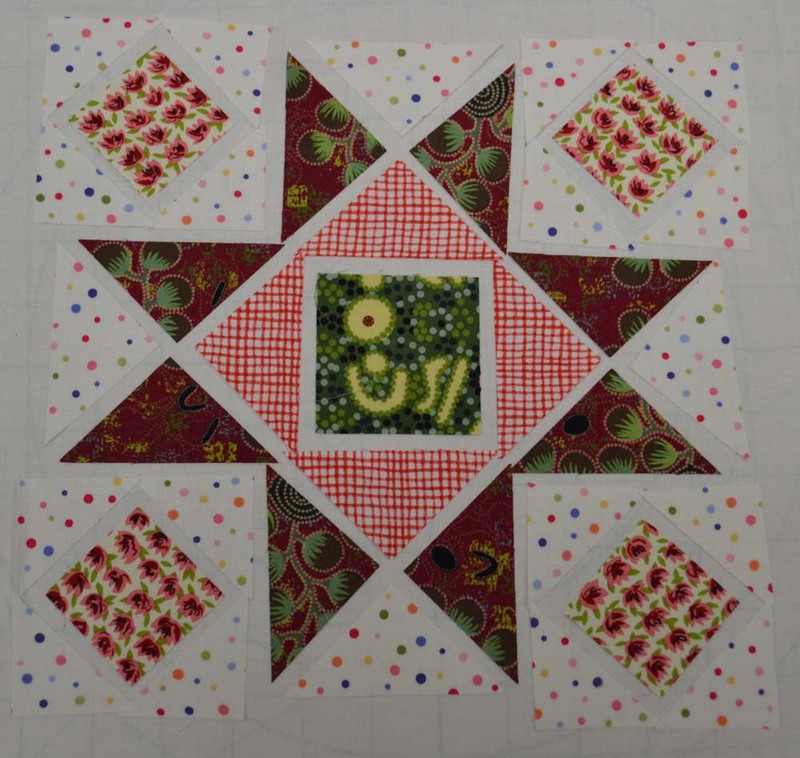 You can see that Ann’s quilt will be quite a bit brighter and will pop a bit more. 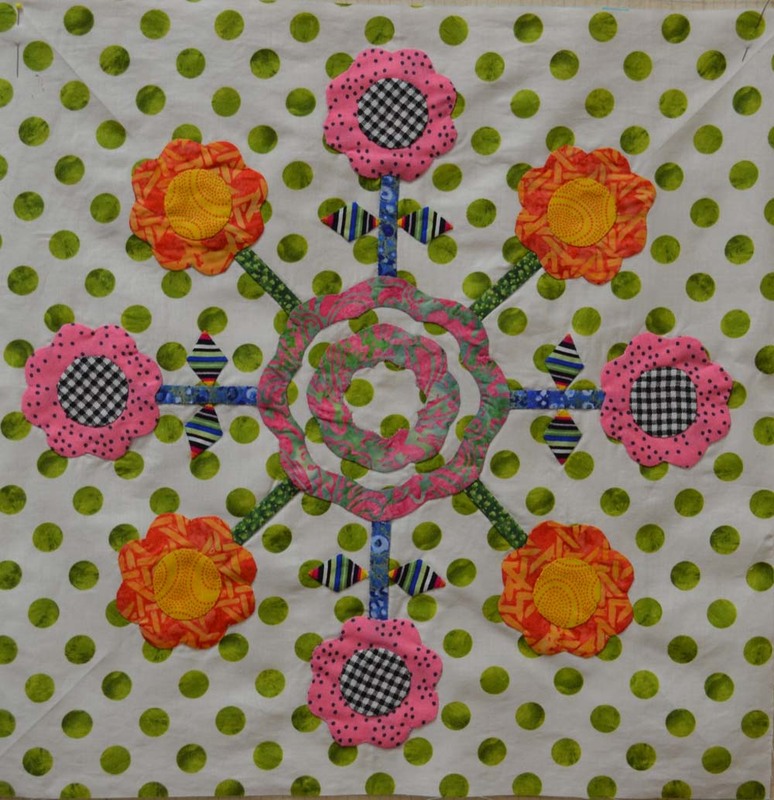 She will be using whites and brights as background fabric rather than grays and creams. 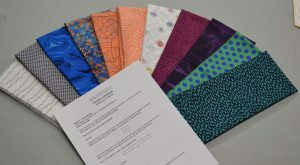 We anticipate receiving the template kits in the next week or so, and we will mail them out shortly thereafter. The scheduled start date is March 1, and if we get them on time, we’ll get them to you shortly thereafter. If you haven’t signed up yet, we still have room. Click here to sign up. 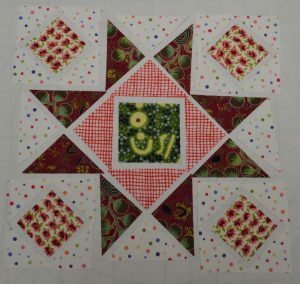 12” Star Block with Cross is found on page 16. 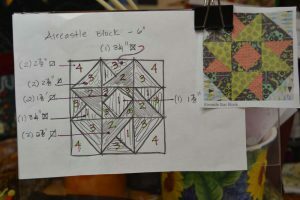 This block is pretty straightforward so I don’t have any special knowledge or instructions. 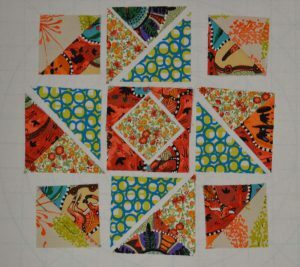 For each block, you need four foundation pieced corner squares for a total of 32! 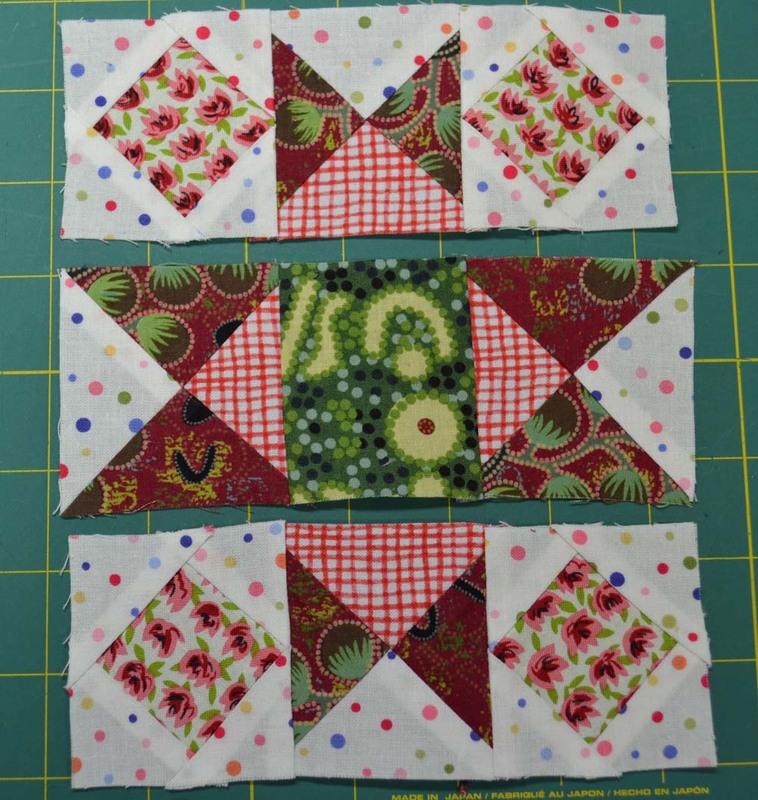 As I mentioned before, I did not make sure each corner piece was identical, I felt it would be too much to ask of myself to keep track of which strip went where. If you want to make sure each corner is the same, you will need to make them four at a time. For me, I decided to make all 32 at the same time. 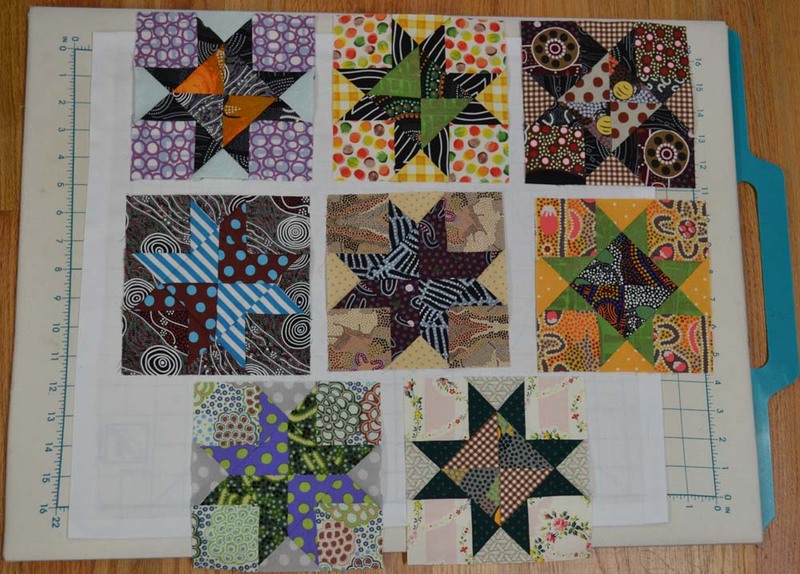 Actually, we will need another 16 for the 12” Eight Pointed Star blocks, so we’ll need 48 in total. 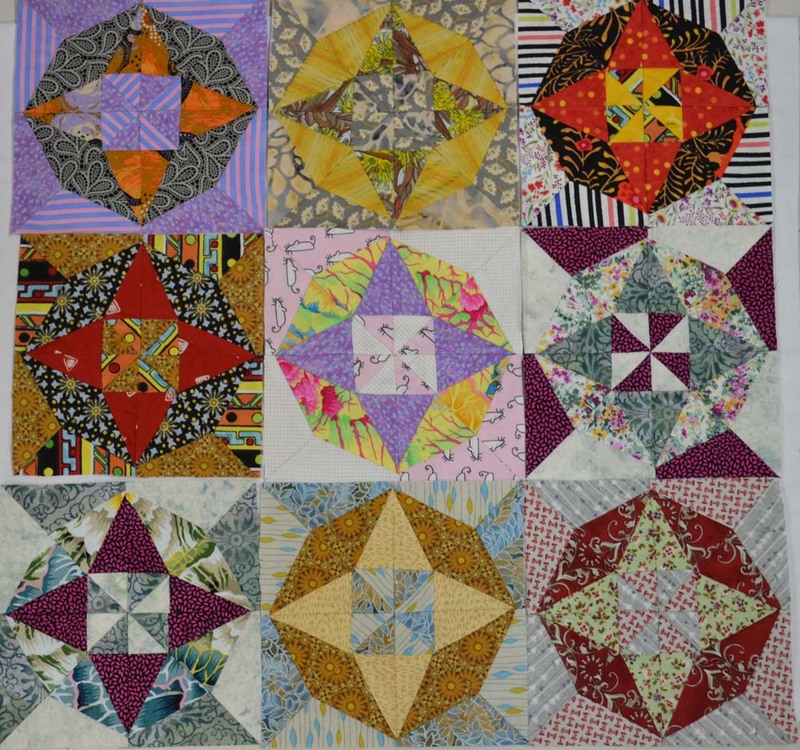 Eight Pointed Star Block 12” is found on page 27. 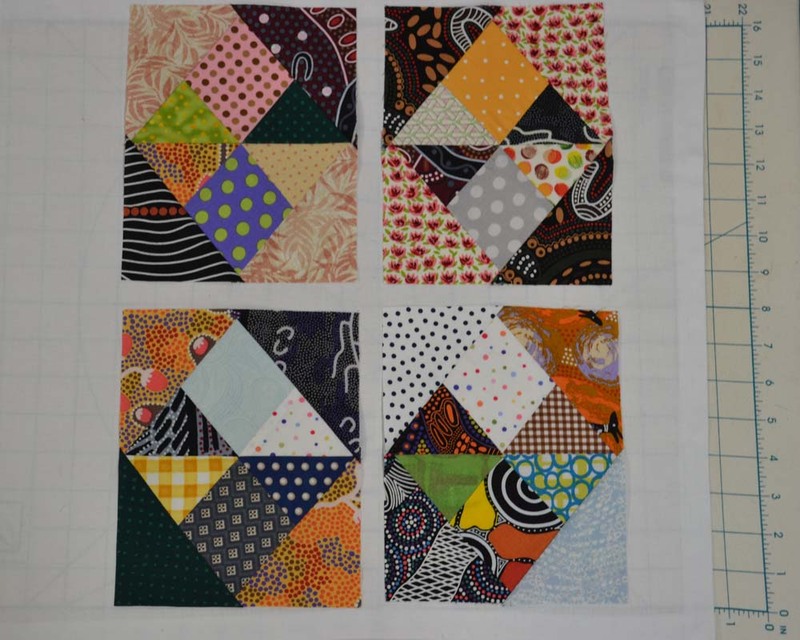 This is the same block we made in Month 1. The only difference is this block is 12”. If you need a refresher on ‘Y’ seams, and set in seams, please refer to this information found in Month 1. 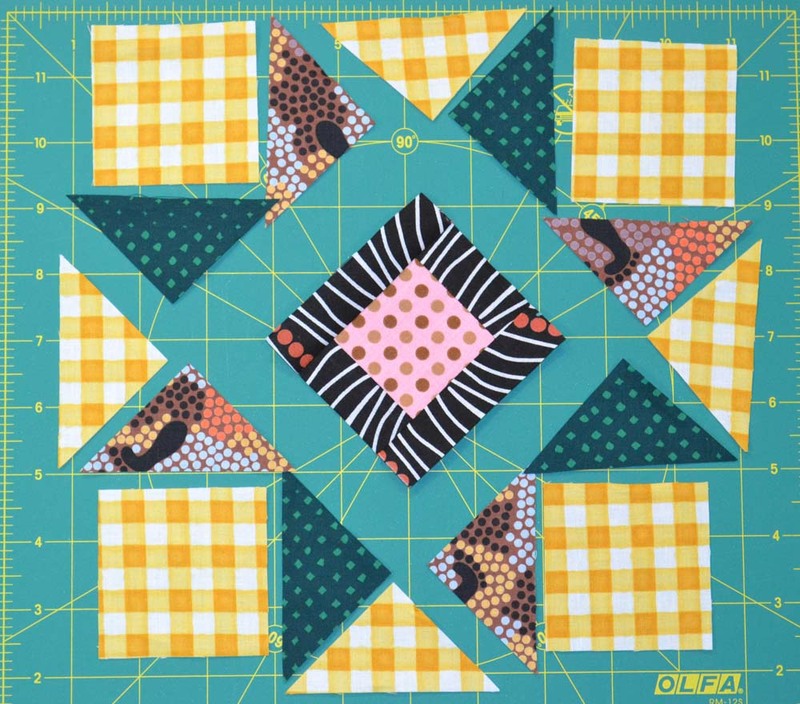 Also, remember that we posted videos with some helpful tips on this on the HeartSong Facebook page and on the Bakers Dozen Quiltalong with HeartSong Facebook page. 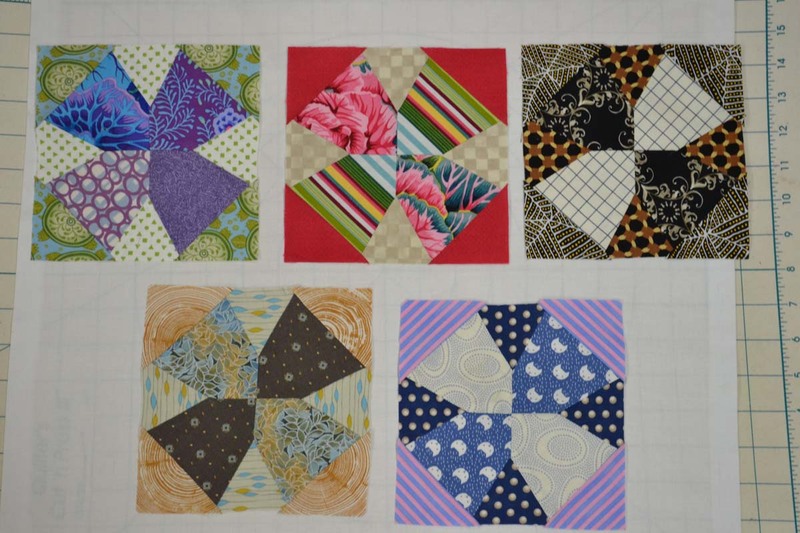 As I mentioned before, you will need four foundation pieced 4” x 4” corner blocks for each block, for a total of 16. 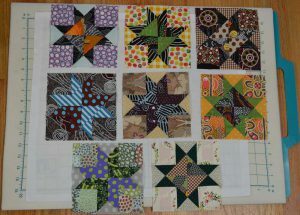 Unfortunately, I neglected to take a picture of any of these blocks before I put them all together. No reason, I just forgot. Good luck, have fun, and I’ll be back in a month! Hello, everyone! We will now begin the blocks consisting of the second border. 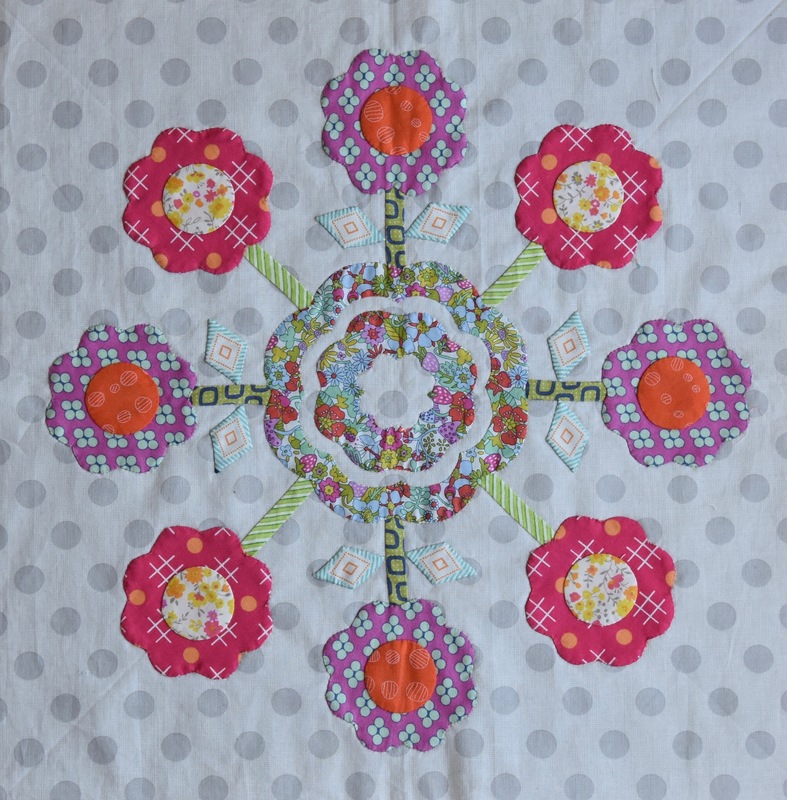 You can sew the center blocks, inner border and the first border with the blocks from the first three months. 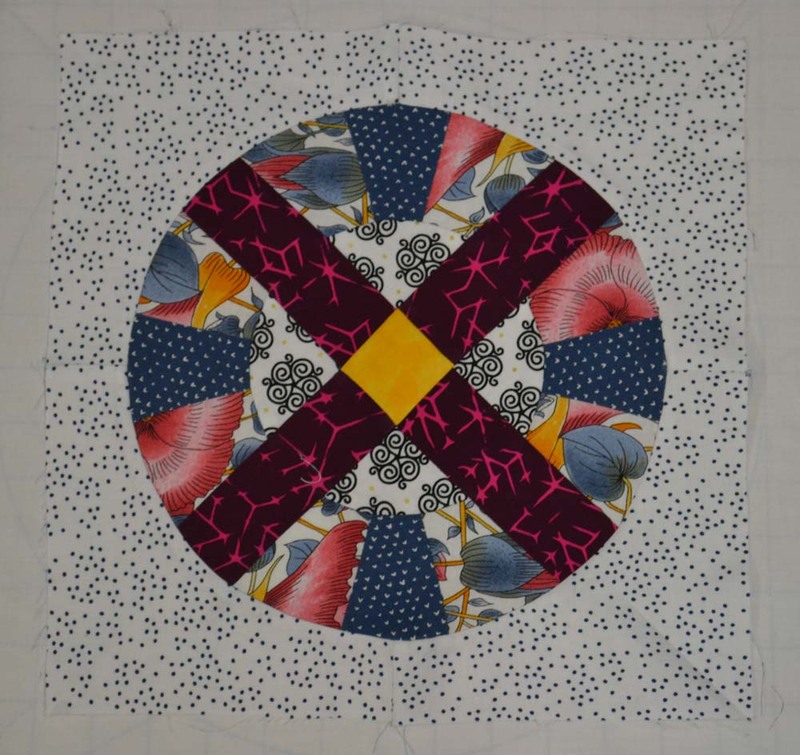 I like the fact that we can build the quilt as we go. 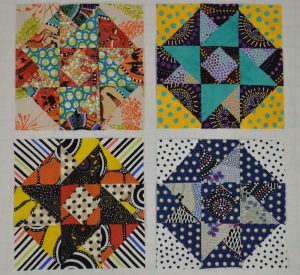 This month, we will be making (4) Jewel Box blocks found on pages 14 & 15; and (8) Checkerboard blocks found on pages 15 & 16. Jewel Box Block: The drawing in the pattern makes this look like a square, it is not. 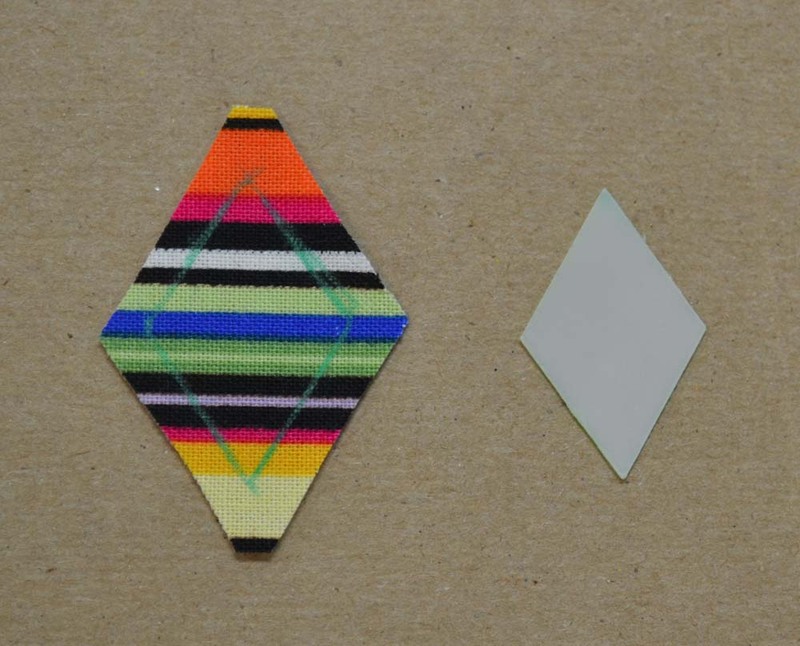 The templates are diamonds or triangles. Once again, I suggest you lay out the pieces, and sew each section. Watch those sneaky T6 corner pieces…I kept sewing them the wrong way around. 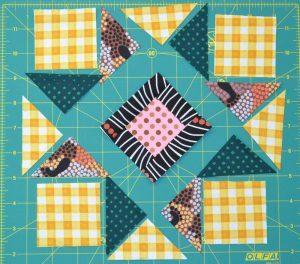 Checkerboard Block: The pattern tells us to cut 42 – 1 ½” squares for each block! 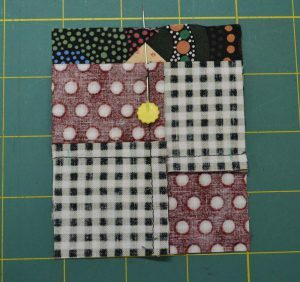 That’s 336 – 1 ½” squares! Not for this girly I can tell you that. 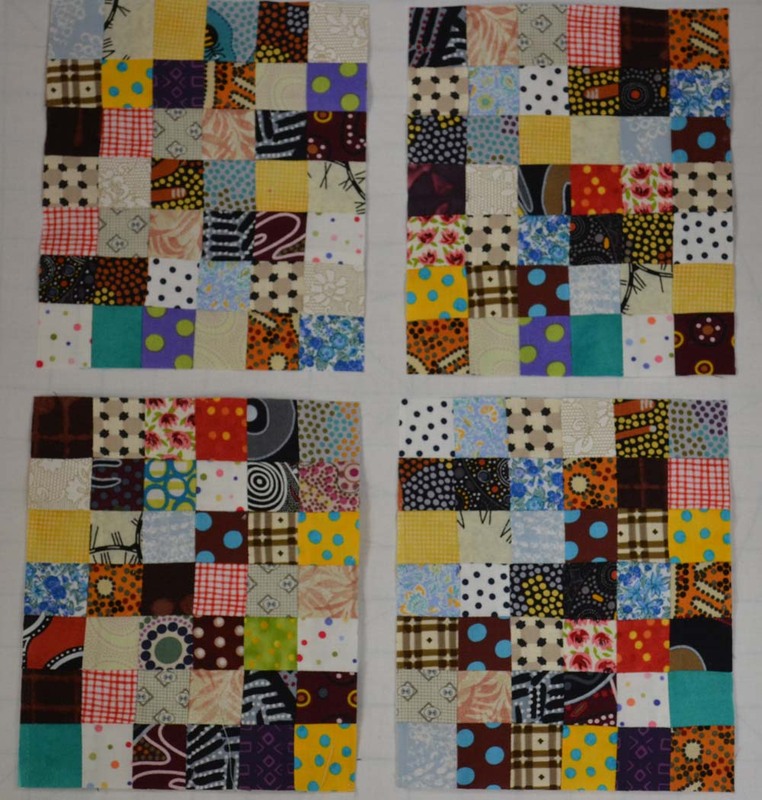 I cut 1 ½” strips and sewed six of them side by side, then sub cut and sewed these together to make my blocks. 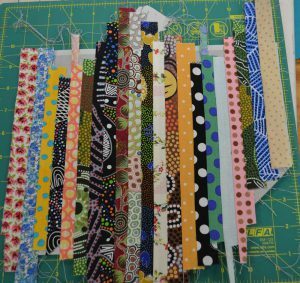 I made several strip sets, so it was plenty scrappy for me. I made four from page 15, and four from page 16. Thanks everyone for posting your progress. So fun to see the blocks. Until next time, keep yourselves in stitches! Delilah Month 11–Princess Cut; make 9 blocks. Hi Everyone and Happy New Year! Hope you all had a wonderful Holiday and a break from all that the world throws at you. This month we make 9 Princess Cuts. 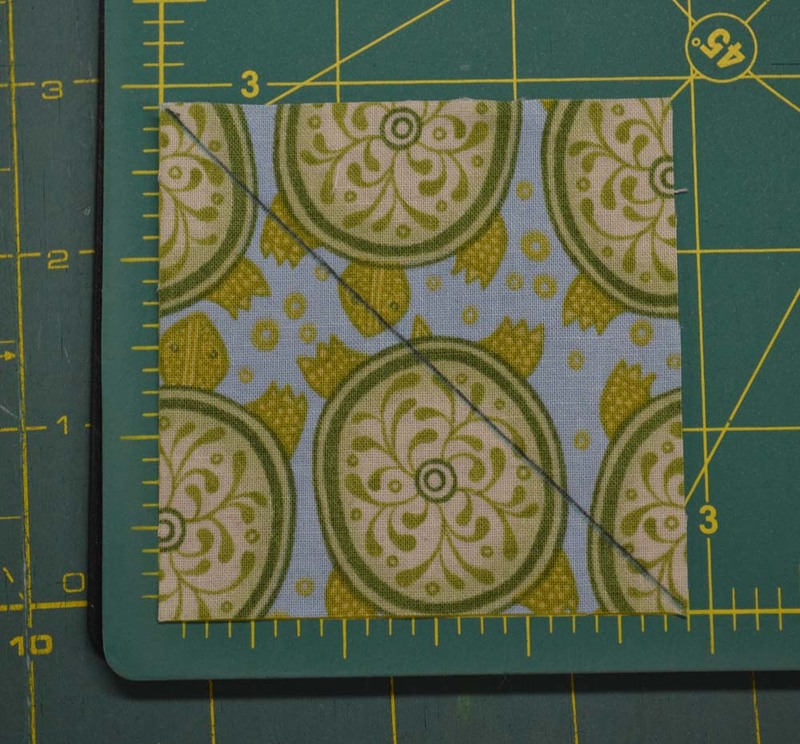 First things first — there is a correction to the pattern under CUTTING. The first line reads: Cut 4 x T32. 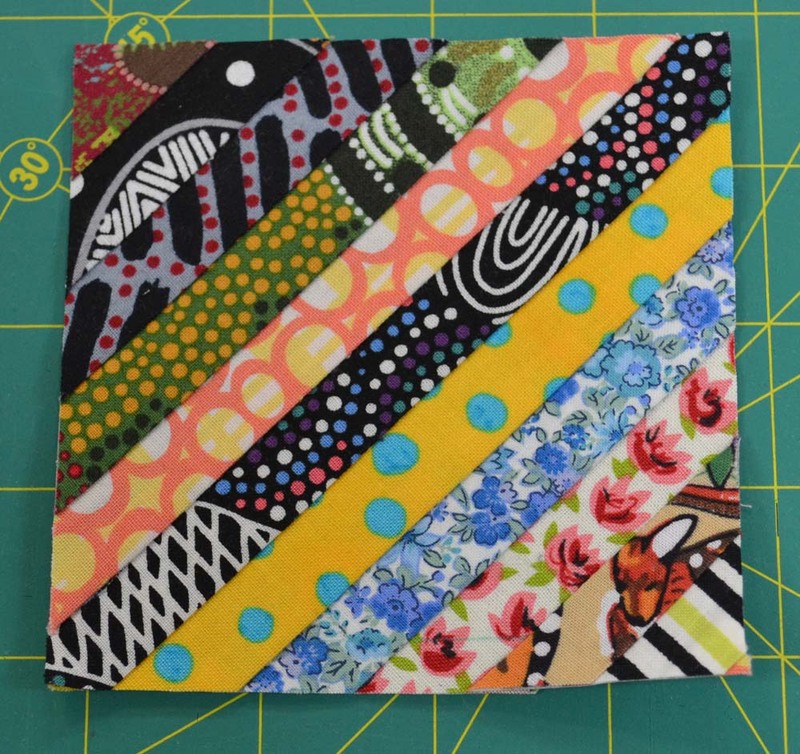 Please change your pattern to read: Cut 8 x T42. That’s it, probably a little typo. 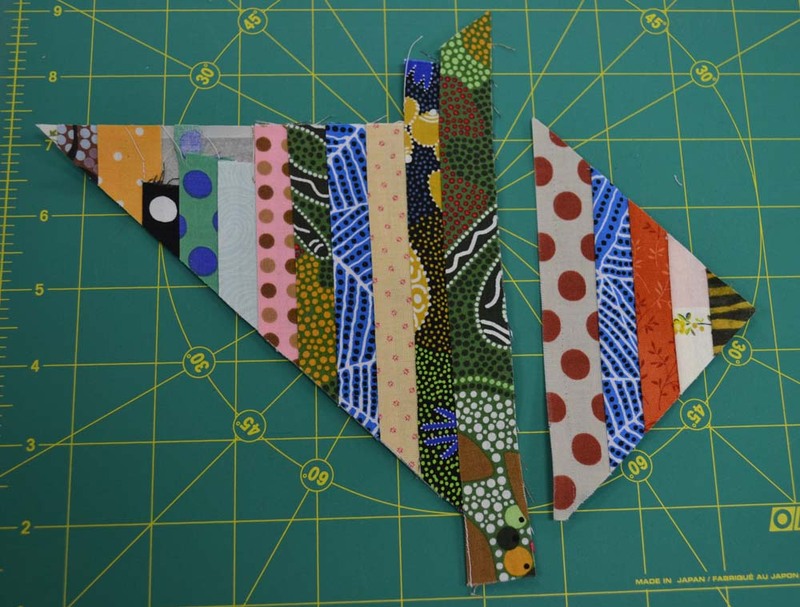 You could go ahead and use the T42 template, but it is a 45 degree angle, so if you cut a 2–5/8” x 2-5/8” square, then cut diagonally 2 times, you will get four 45 degree triangles. 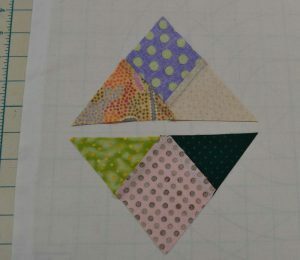 Cut a second 2-5/8” square and you have eight triangles for the center of the block. 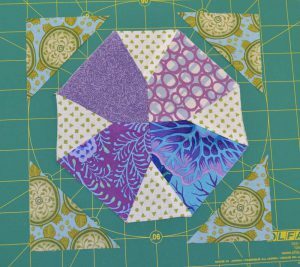 With all the points in this block, pressing is super important. Just remember to press the seams of T45/T44/T43/T42 to the left. Press T45 Rev/T44/T 43 Rev/T42 to the right and all should be well. Press seams open when you join these sections. Thanks for with sticking with us! 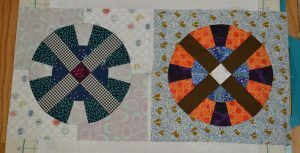 This month we are making the rest of the 6” blocks that will be used in the two borders that surround the center medallion blocks. Aircastle Block, pages 9 & 10: Confession time…I got really confused in reading the pattern, and trying to decide which fabrics to use and my color placement. 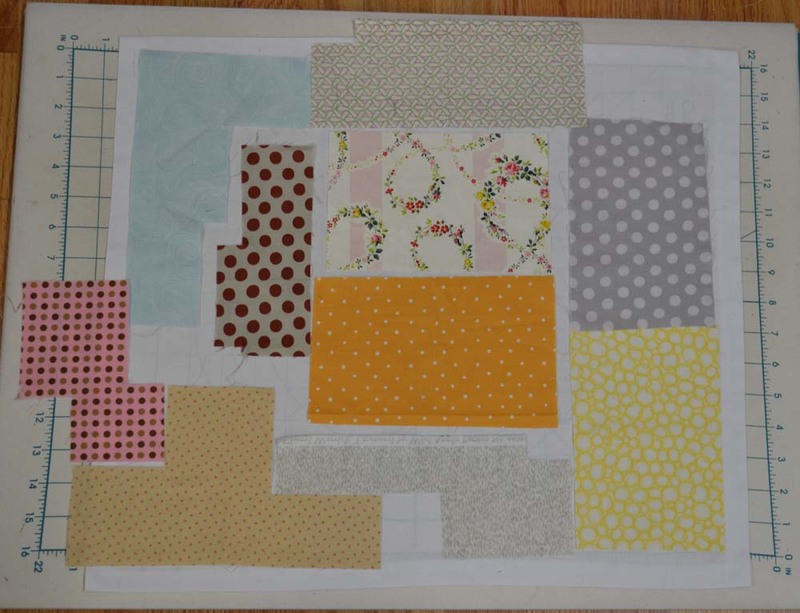 I drew a little cheat sheet with the pieces numbered to correspond with my fabrics and the sizes to cut each. This really helped me. 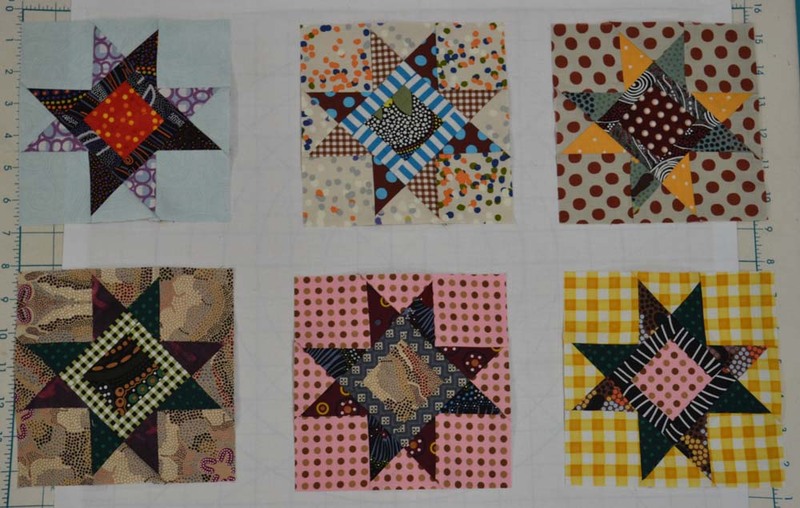 I also cut each piece for each block and arranged them in the appropriate place, before I began to sew. 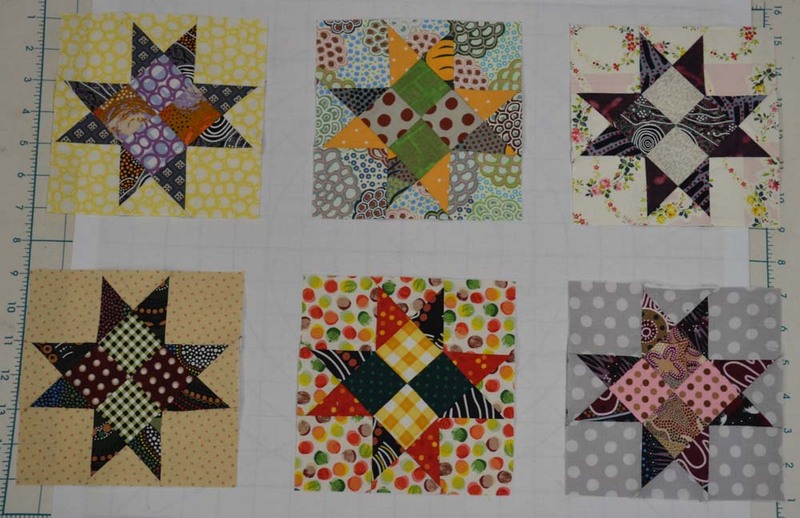 The next set of blocks will be the Combination Star Blocks, pages 11 & 12. As in all the other blocks, lay out your cut pieces before you begin sewing. 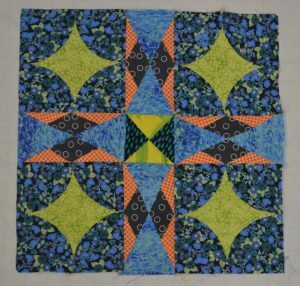 This blocks has triangle points that meet in the center of the block. 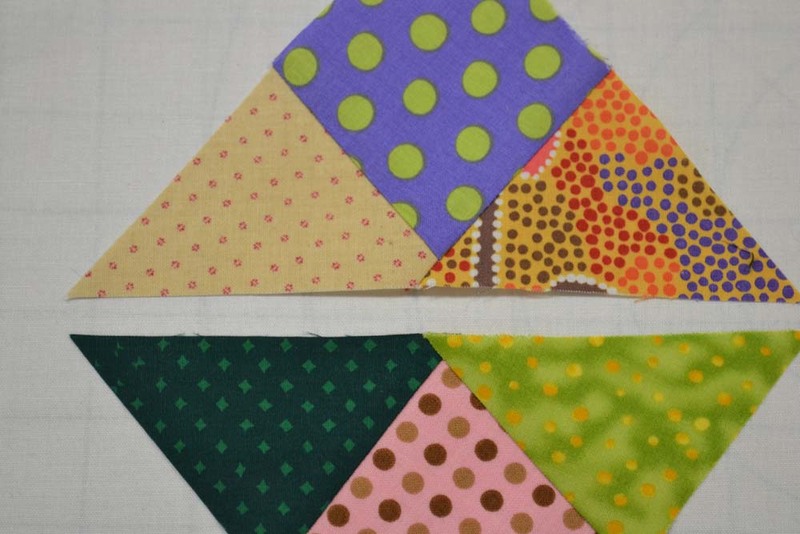 If you have trouble with triangle points, I’ll show you how I keep my points “pointy”. Insert a straight pin at the point of the first triangle, and then through the point of the second triangle. Do this on each point to be joined. 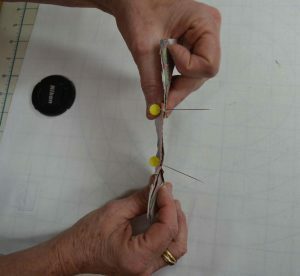 Pull the pin so it is straight and the two pieces are lined up together. 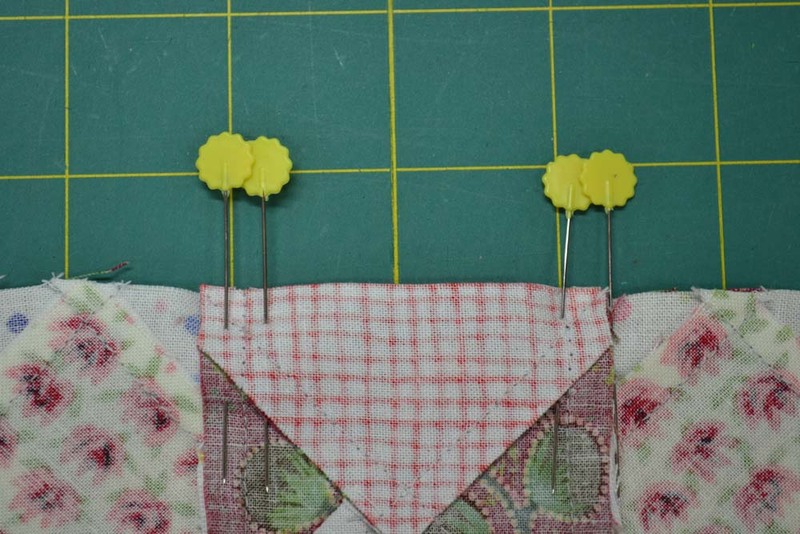 Put a pin on either side of the seam to hold that exact place tight. 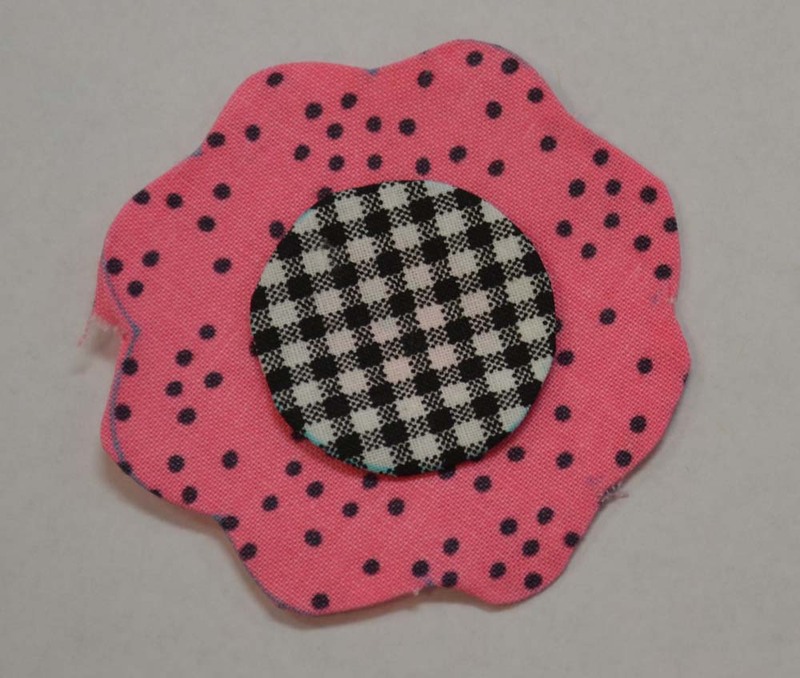 When you sew this piece, do not remove the pins, but GO SLOWLY over the pins so the seam doesn’t shift. The last eight blocks we will make for this month will be Willow Block, page 13, which is a rectangle. Finished blocks size will be 7 ¼” x 6”, but again, your finished block size may vary. 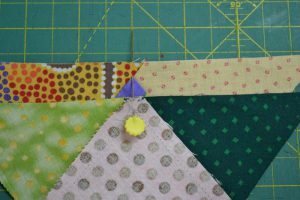 All of my blocks are measuring ¼” smaller. The point is they are ALL measuring ¼” smaller, so they will fit together beautifully in the finished quilt. You will need to cut templates for this block. 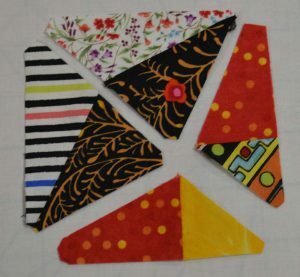 Sadly, none of the triangles are 60 degrees or 45 degrees. 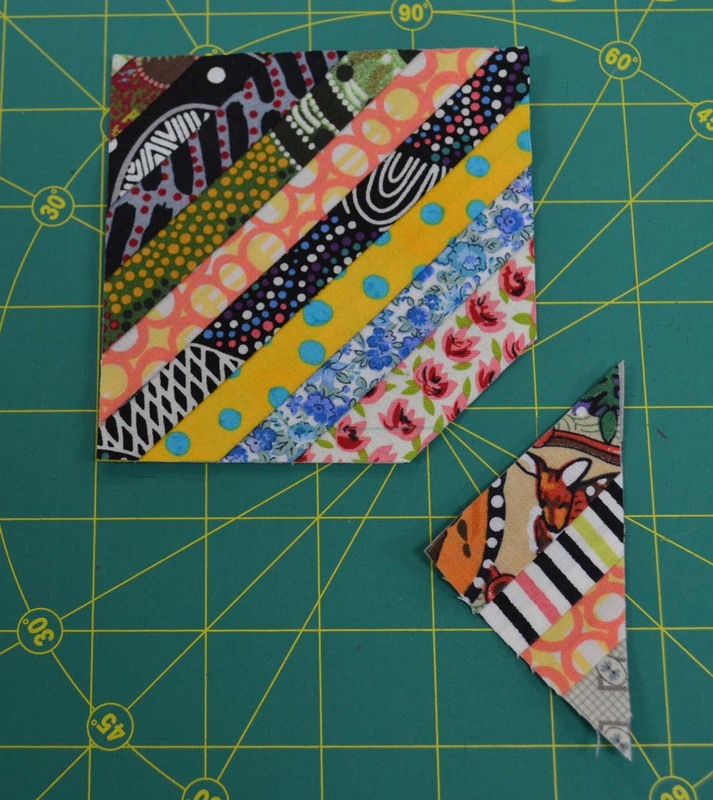 I did discover that by cutting a 3 ¾” x 4 ¾” rectangle and cutting it diagonally we can make two T8 triangles. Make another 3 ¾”x 4 ¾” rectangle and cut it diagonally the opposite way to get two T8 reversed triangles. Of course, if you want four fabrics for each corner, you’ll have to cut them one at a time. 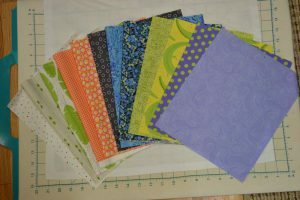 The Willow Block has two options so I’m going to make four of each. 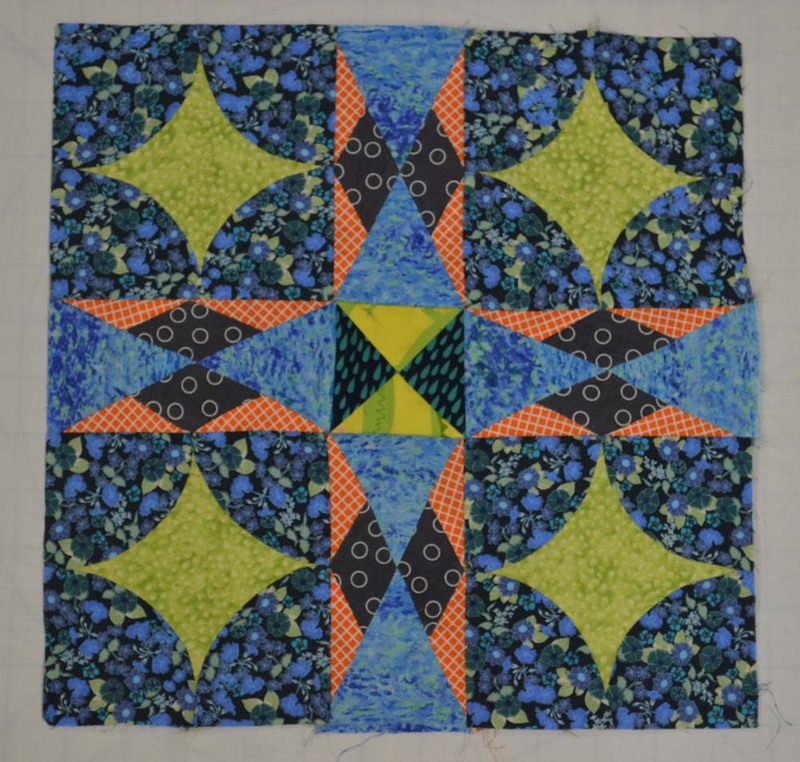 The first version of this block has the two diamond points meeting at the center. For this reason, I have pressed one set of seams toward the center, and the opposite set of seams toward the outside. 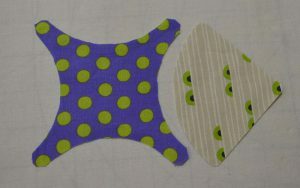 This will allow you to “snuggle” your seams together for a perfect fit. 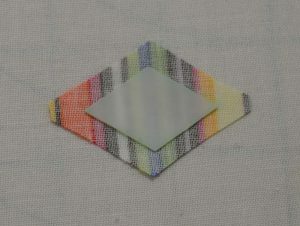 Use the same technique with a straight pin at the points on both diamonds. You’ll be able to feel the seams and just make sure they line up properly. 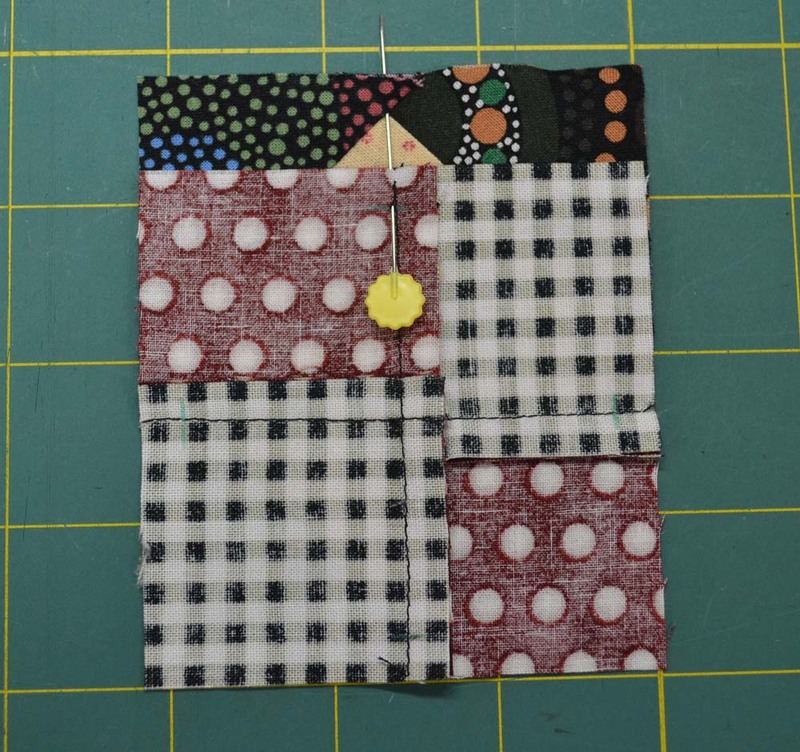 Luckily the alternate version of this block is much simpler, no points to align. Yippee! 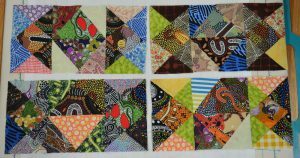 Thanks to all of you who are sharing your blocks on our Facebook page. Have fun and see you all next month! Hi everyone, we’re getting close to the finish line! 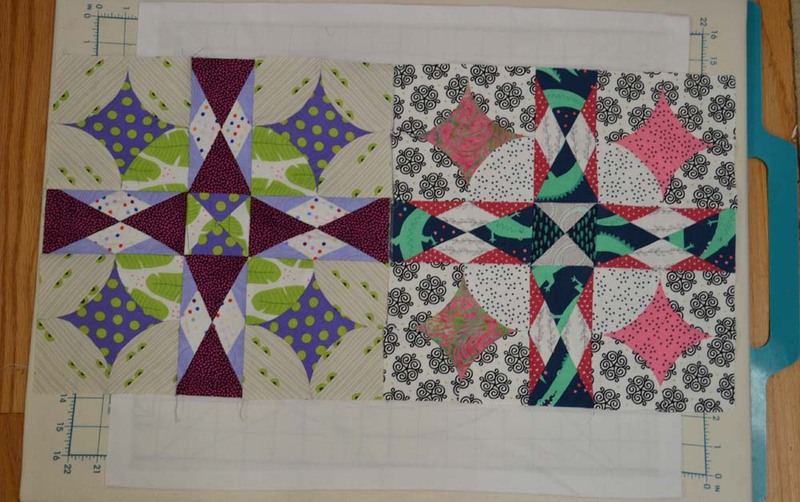 There is a “Y” seam in this block, but after all the blocks we’ve done, this is a piece of cake. T-40 IS a 60 degree triangle, so it won’t matter which point you use as the center. 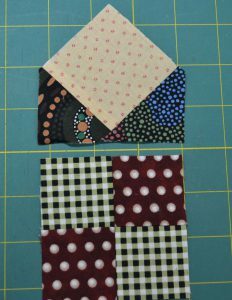 T-41 IS a half square triangle, so you could cut (2) 2 – 7/78” x 2 – 7/8” squares, cut diagonally to make (4) half square triangles. Hi Everyone! 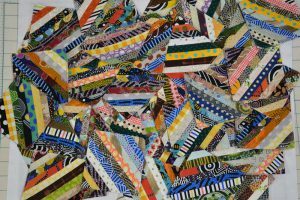 Ready for more blocks? 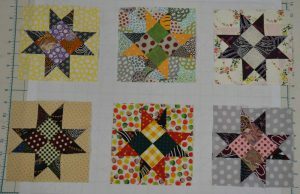 This month, we are piecing twelve of the ‘Another Star Block’ found in the pattern booklet just after ‘8 Pointed Star’. 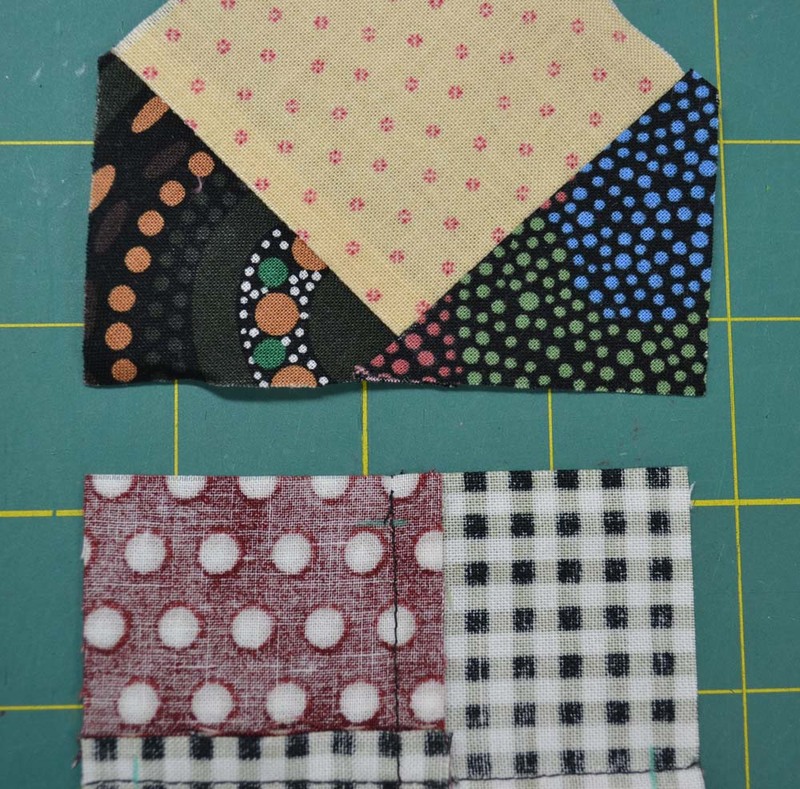 The pattern has an alternate layout that I also like, so I decided to make six of each. 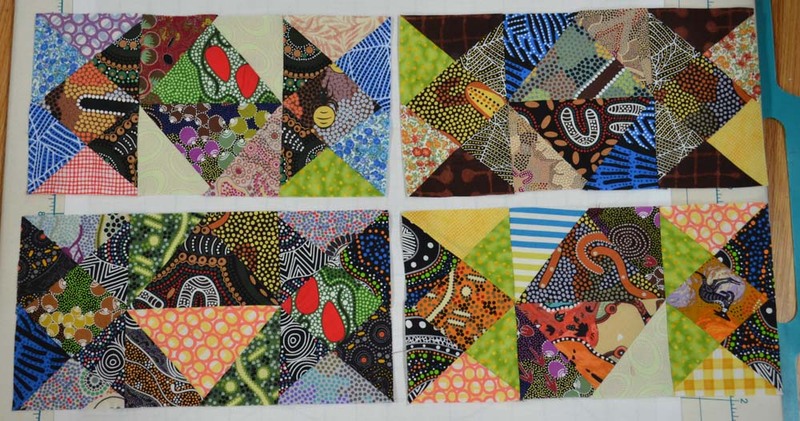 We will also be making eight ‘Hand of Friendship’ blocks. 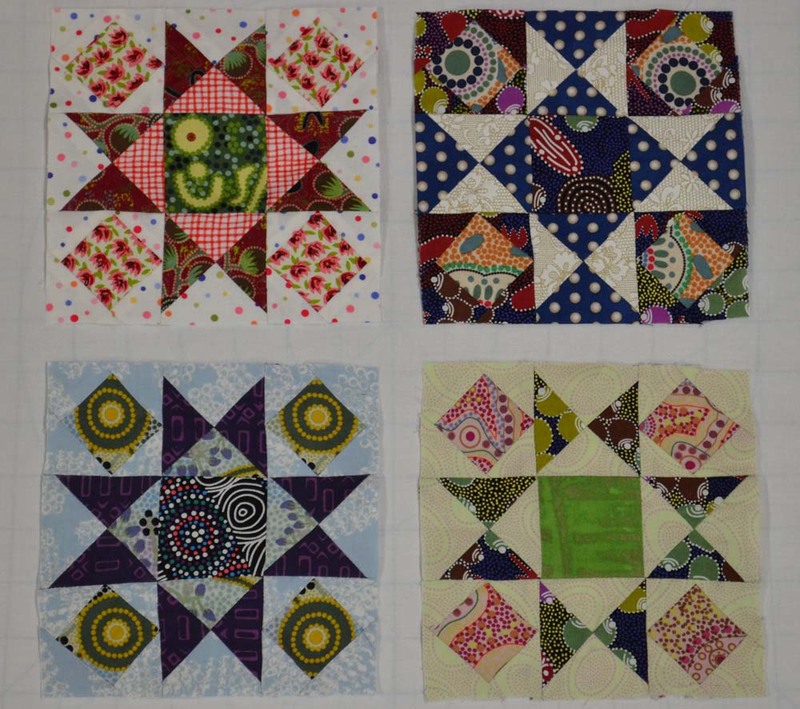 These will become part of the first ‘border’ around the center four blocks. 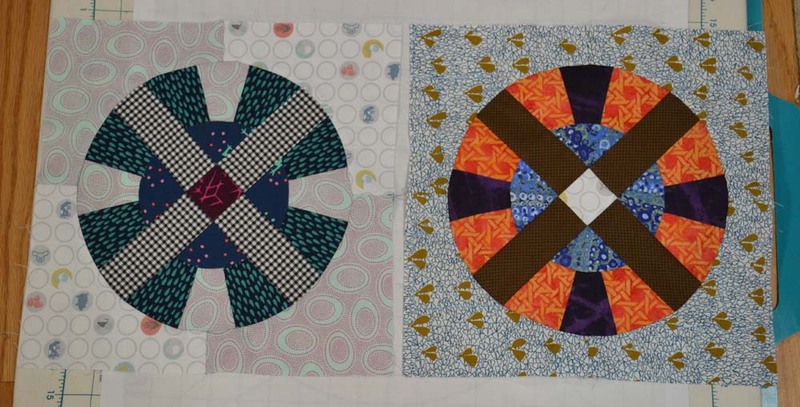 This way, you can build the quilt as we finish the blocks that go into each of the borders. 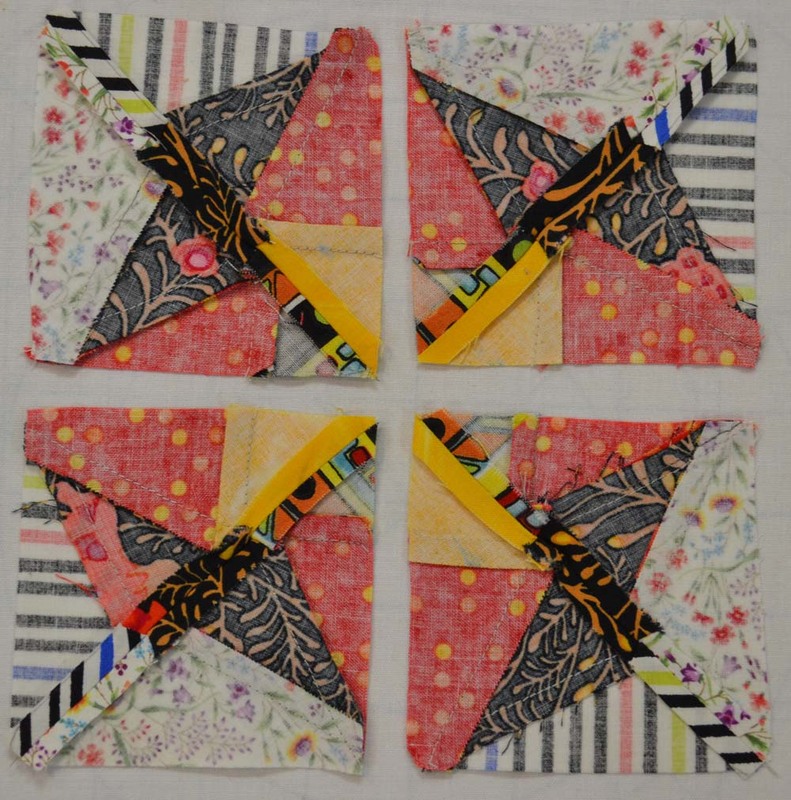 Another Star Block – make a total of 12. 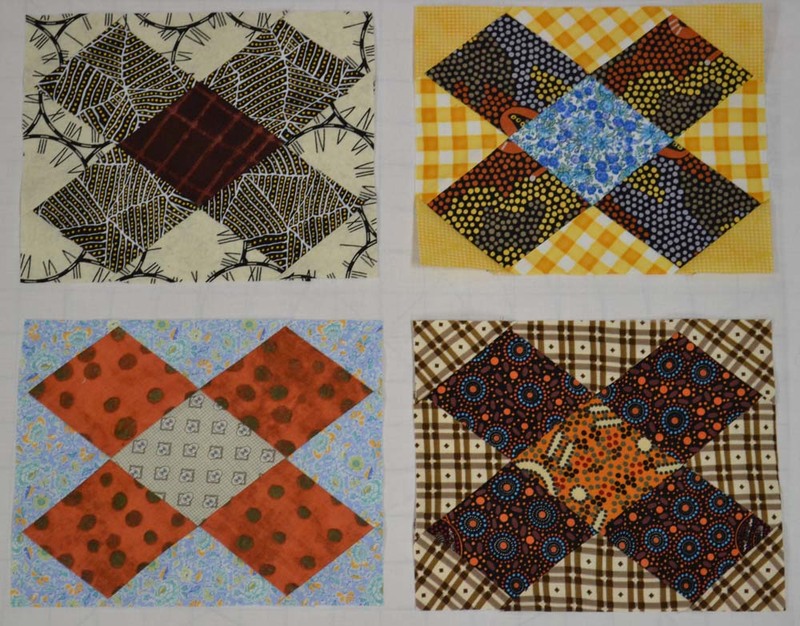 I made six of the original pattern (page 5), and six of the alternate (page 7). 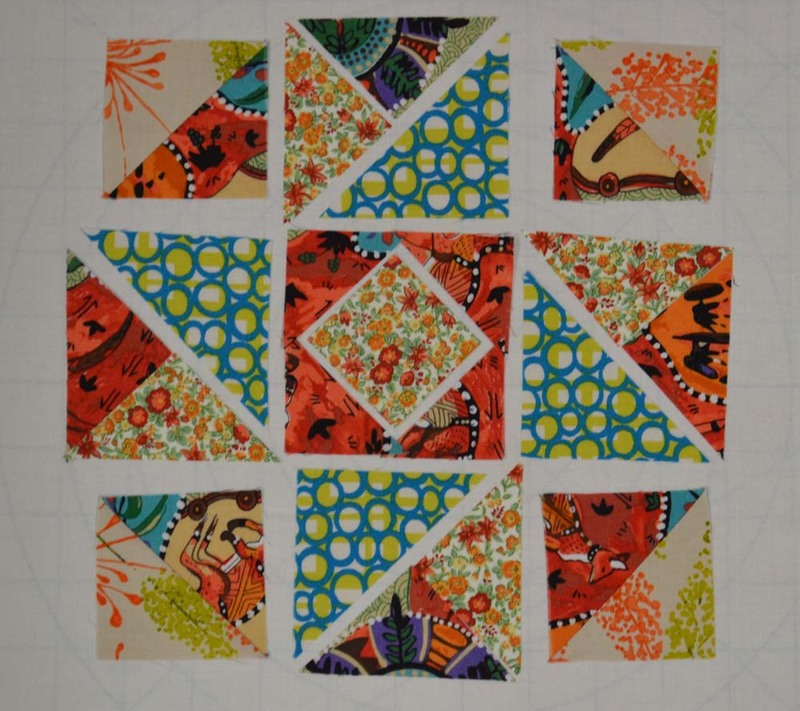 This block is not difficult, but the way it is pieced can be confusing. Just take your time and make sure your pieces are where they should be before you stitch. Check twice, sew once. 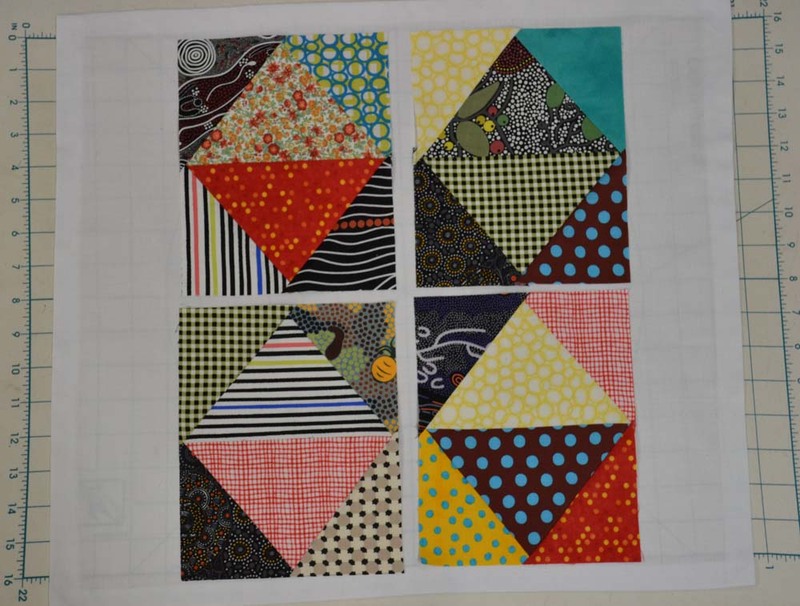 In constructing the block. I pressed all my pieces away from the center. 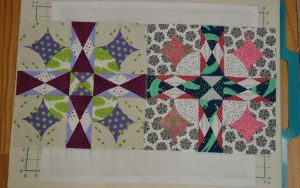 The only section that I pressed toward the center was the middle section as I finished piecing the block. 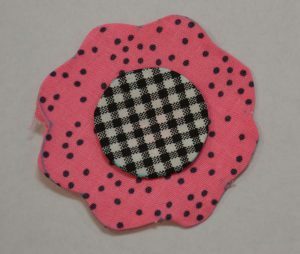 I pressed toward the center so my seams would sandwich nicely when I added the two outside pieces. 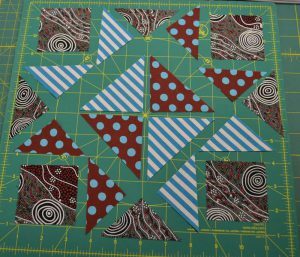 Once I started working on the alternate layout, I realized it would be a little more work as I had to line up the seam in the center piece with the point on the outside corner piece where the triangles meet. 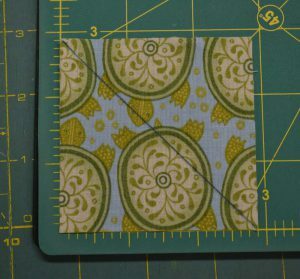 I marked the seam allowance on the back of the center piece. 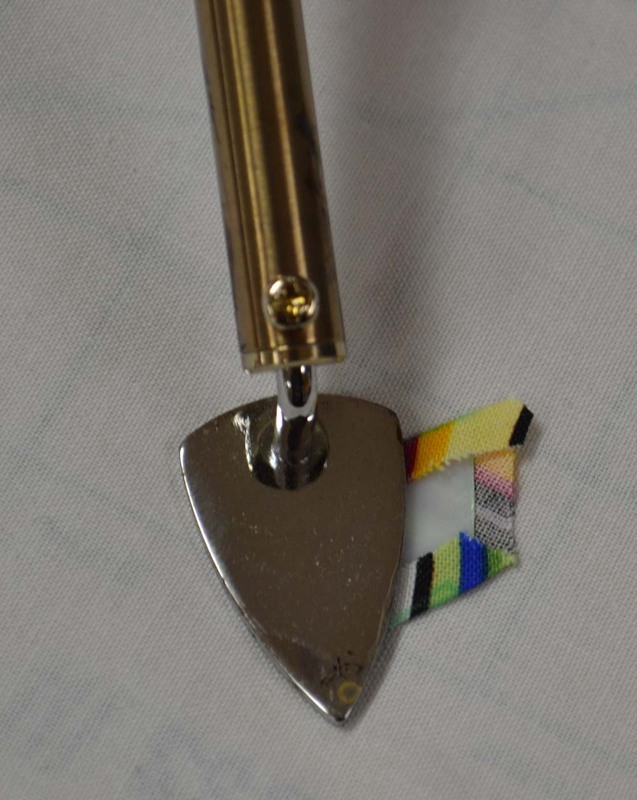 Then I inserted a pin at that mark from the back through the intersection of the triangles on the corner piece. 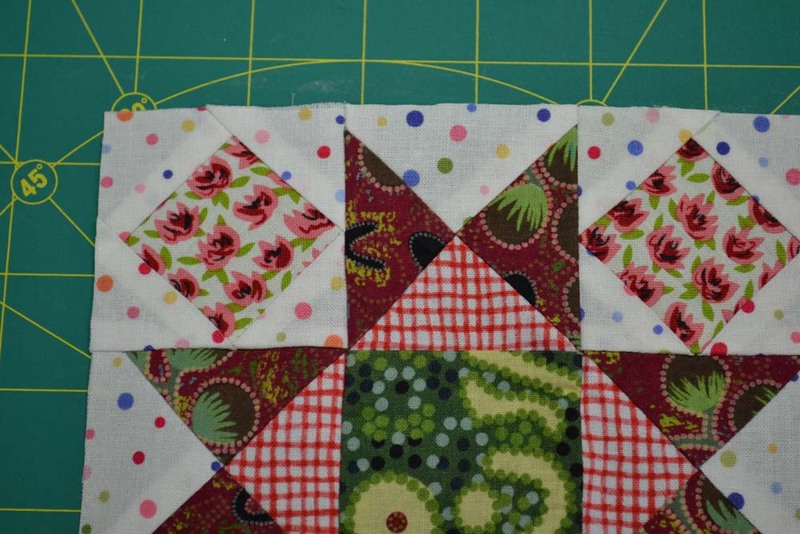 Now I am certain the seams will line up perfectly. 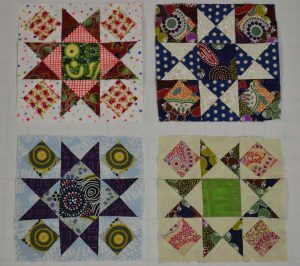 Some of the blocks in Jen’s original quilt used only three fabrics, sort of refreshing for a change. I think I’ll do a few scrappier blocks because I only have small pieces of background fabric left. 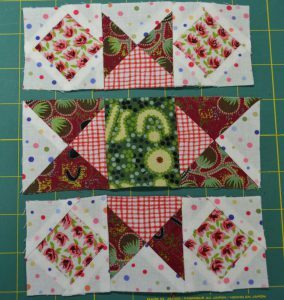 Again, to avoid confusion and un-sewing, I highly suggest cutting the pieces for each block one at a time, and lay them on your work surface in the order you want them in in the final block. 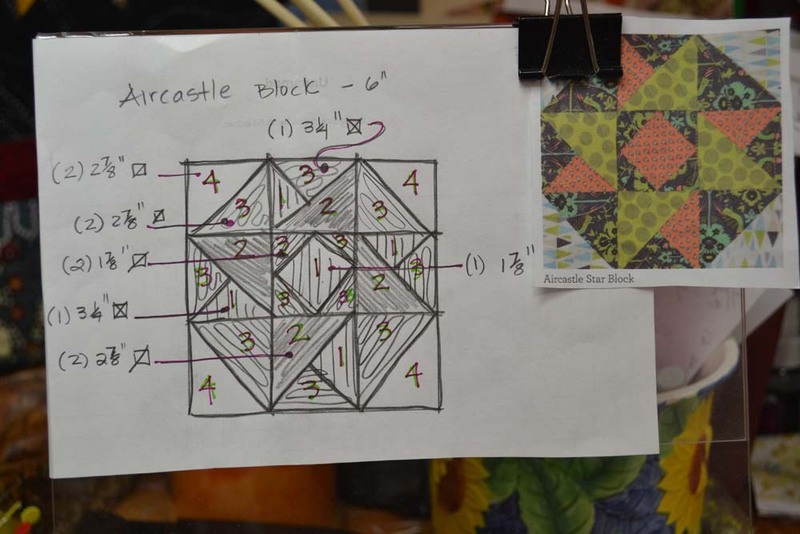 If you have a cell phone, you might want to take a picture of each block as you work on it. You can always delete these pictures when you no longer need them for reference. 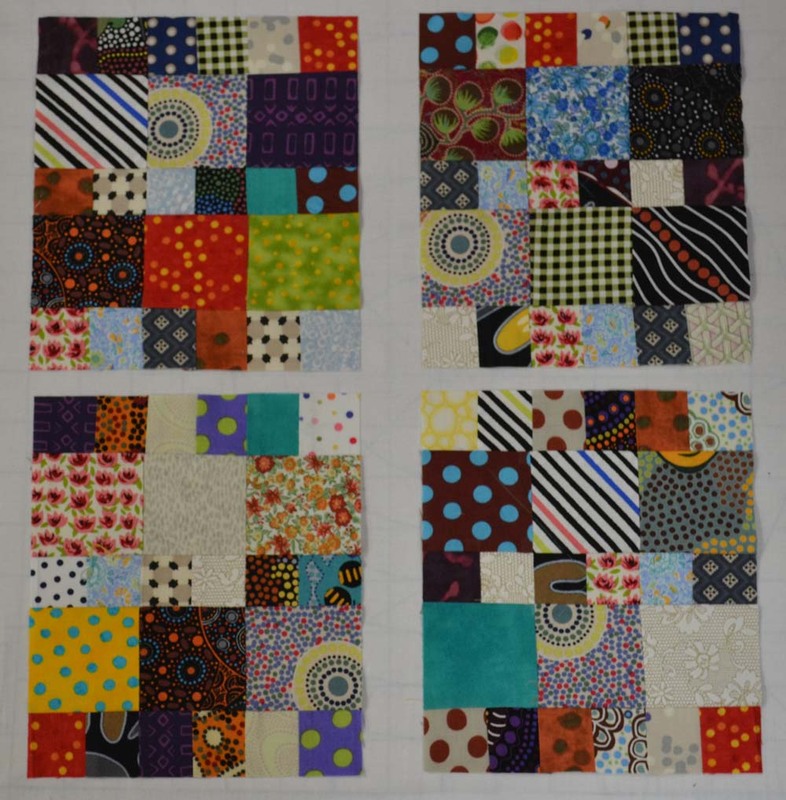 Just a quick look at the first two blocks I’ve finished. 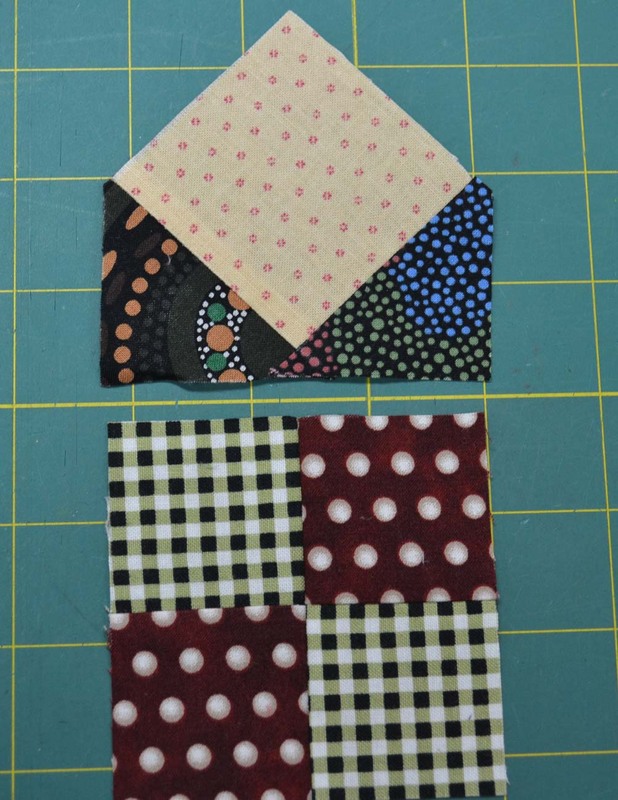 I do like the scrappier block, so I’m going to try to use up my little pieces of background fabric. Thanks, everyone. Have fun with these and I’ll be back next month.